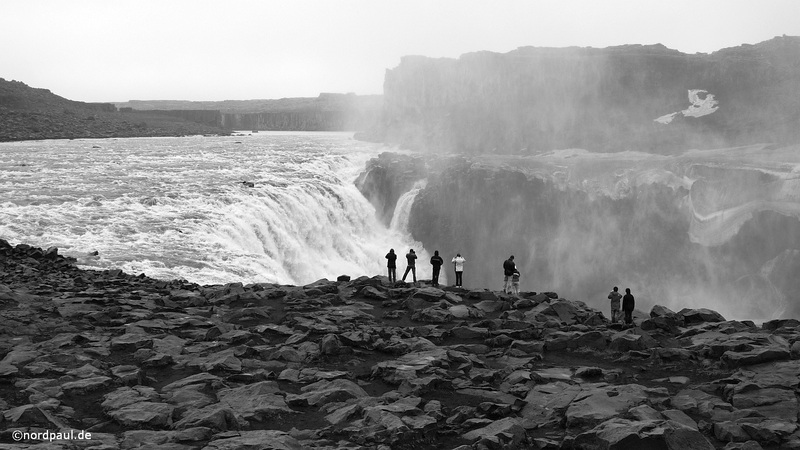 In the middle of May 2010, it is that time again: eight years after my first and so far only journey to Iceland I am back to Iceland again. 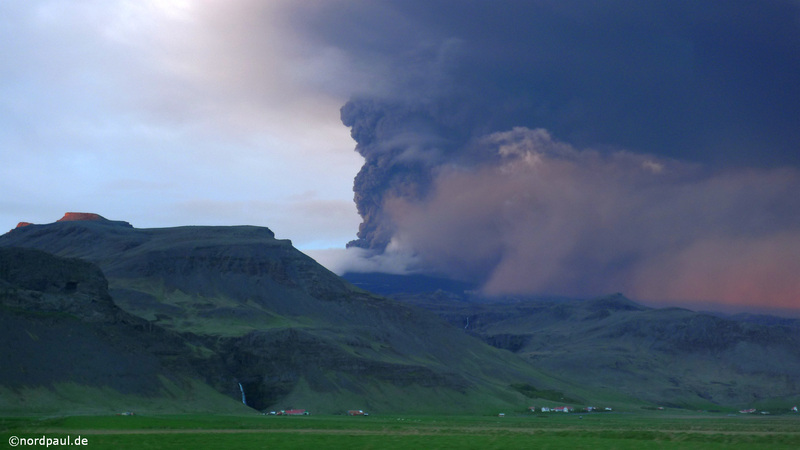 Also the eruption of the volcano under the Eyjafjallajökull cannot stop me. My plane takes advantage of a gap in the ash cloud. 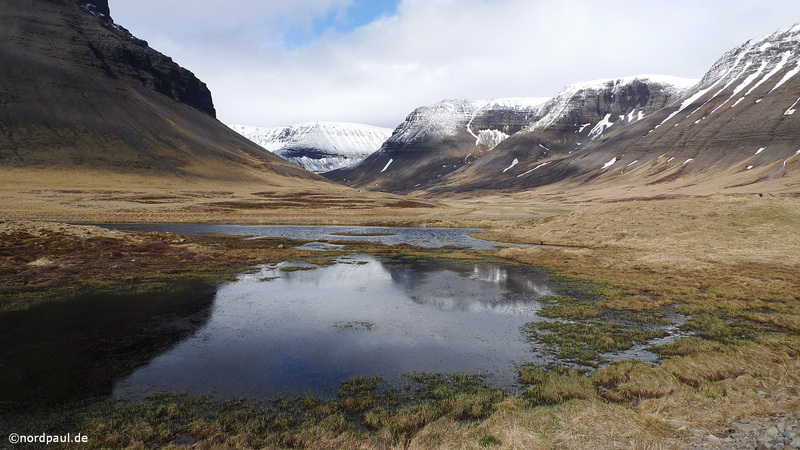 During my three and a half weeks in Iceland, I am in the southwest of the island for a few days, followed by two weeks in the relatively isolated Westfjords, and finally for one week around the lake Mývatn. 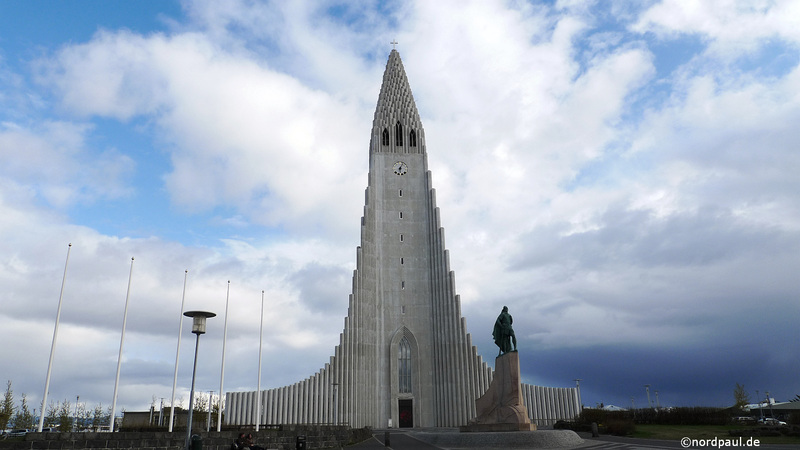 After three and a half hours flight, I reach Keflavík in a slightly cloudy weather and a little later Iceland's capital Reykjavík by bus. There I feel right back home, I lived here in 2002 for four months. 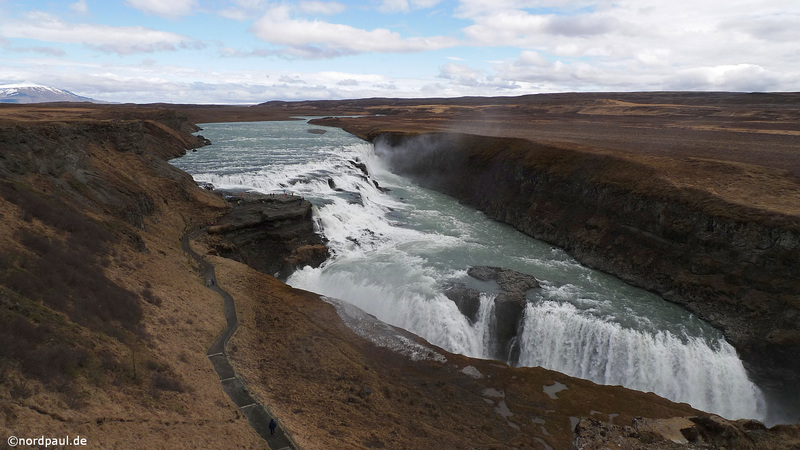 On a scheduled half-day tour on the so-called Golden Circle we pass the volcano crater Kerið on our way to the Golden Waterfall Gullfoss which falls into two mutually perpendicular levels at 11 meters and 21 meters into a ravine. 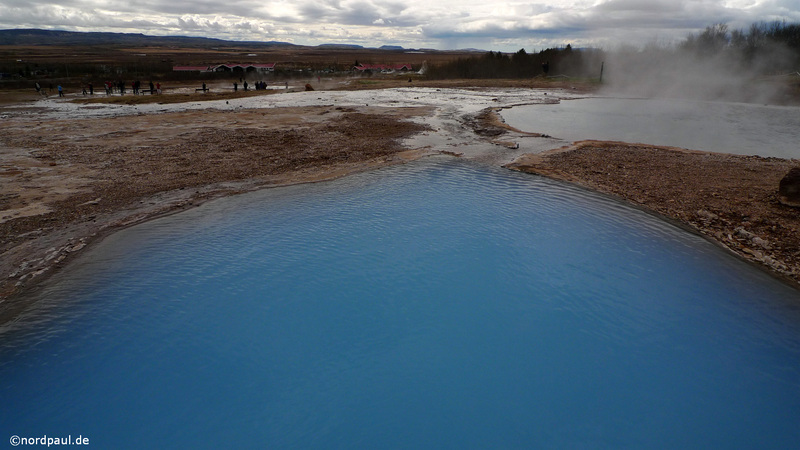 In Haukadalur there is also a thermal field including the blue thermal spring Blesi. 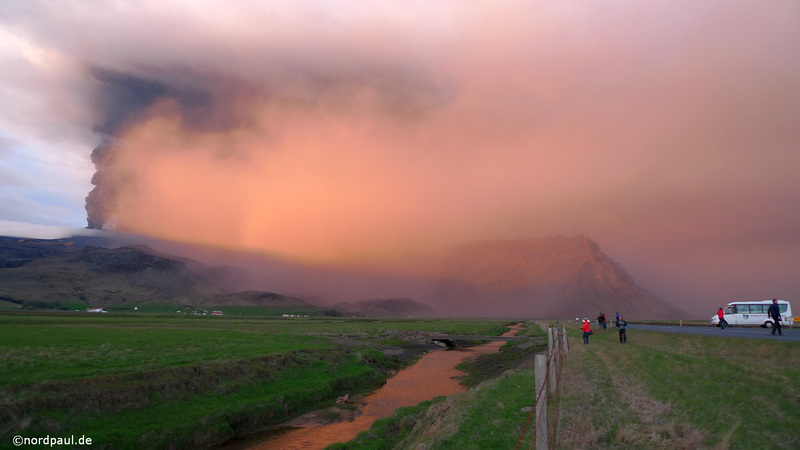 In the evening I will not miss a tour to the Eyjafjallajökull. 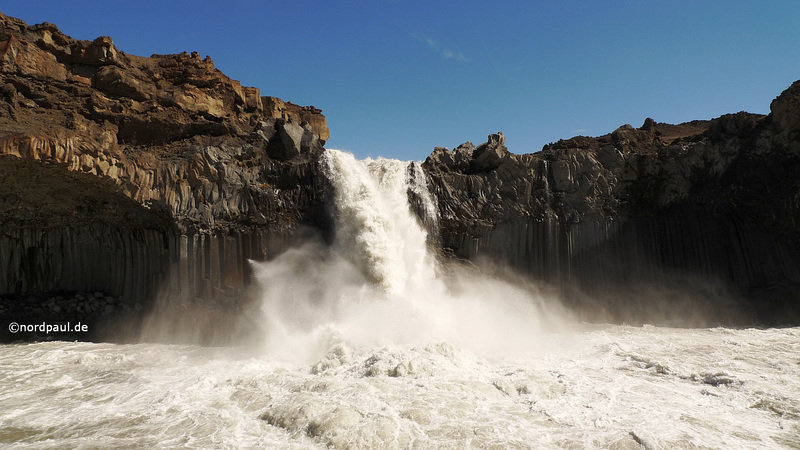 A few words about geography: the Eyjafjallajökull (in English: island mountains glacier) is a glacier quite near to the south coast of Iceland. 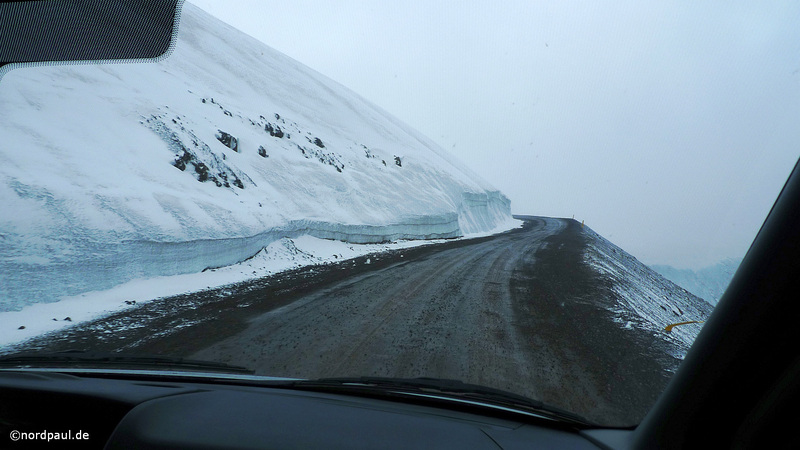 Under the Glacier a volcanic massif is situated with the same name. 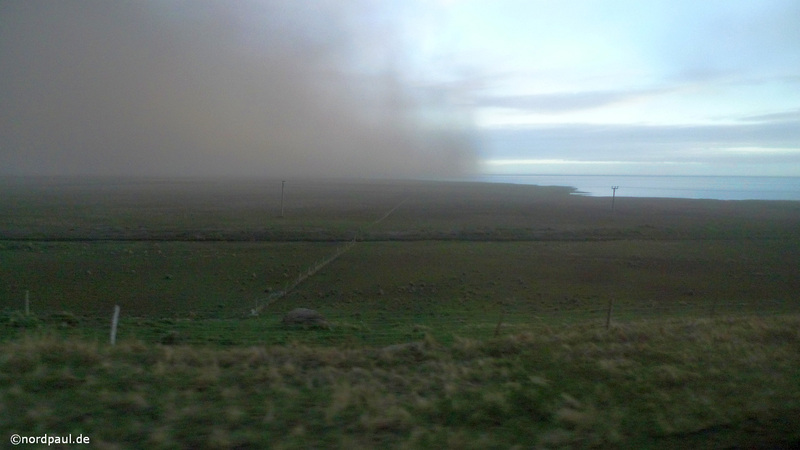 From the middle of April to Pentecost 2010 a lot of ash and water vapor emits up to 9000 m high. 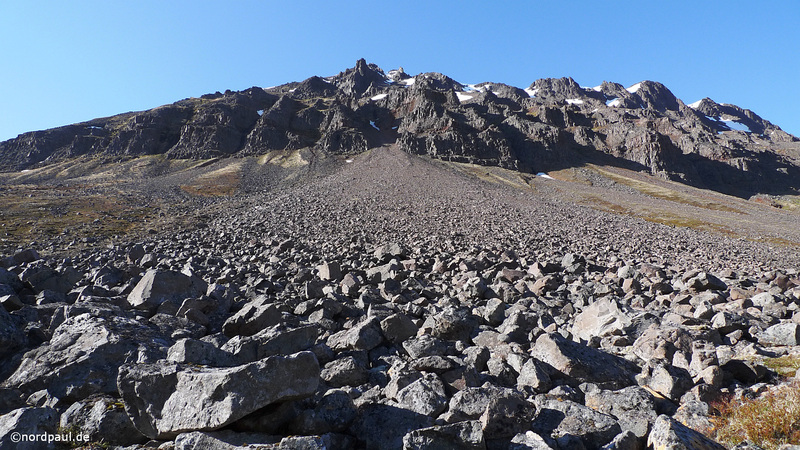 The highest point of the glacier is at 1666 m.
First it is very exciting because it is not known whether clouds could hide the glacier and volcano ash. But then the weather looks good and a huge cloud of gray ash passes silently to the south on to the Atlantic. Even if the ash wall looks very colorful from the outside than from within, we go into the middle of the darkness. 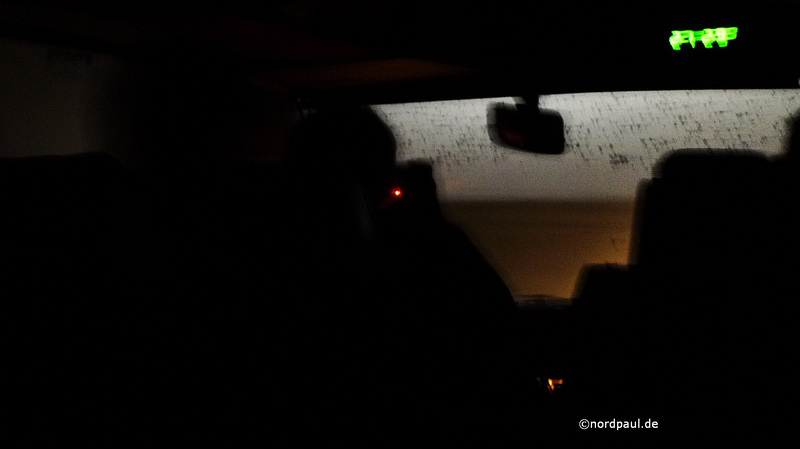 Despite sunshine, it suddenly becomes black as the deepest night, but without stars. A frightening impression. Back in the daylight the sun's last rays are coloring the ash in a bright orange shade. 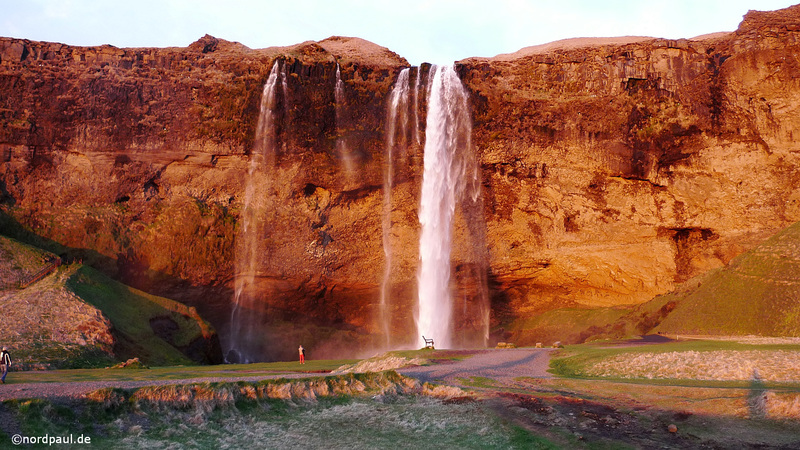 On the way back our minibus stops at the 66 m deep plunging Seljalandsfoss at sunset time. Formerly the Atlantic coastline was at this place. 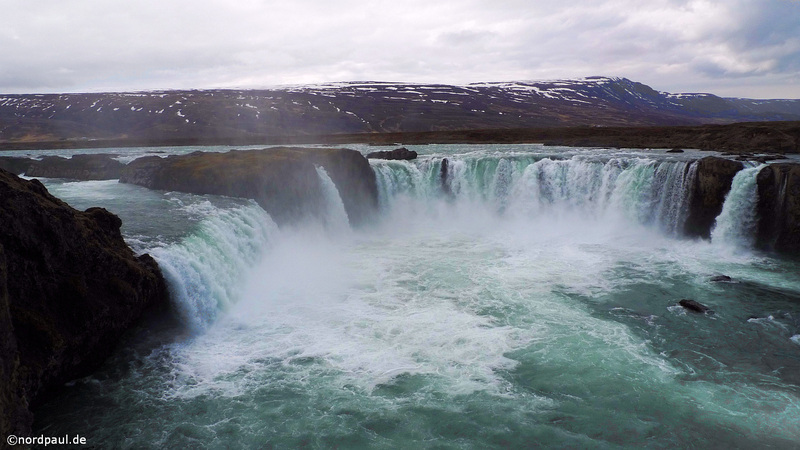 Today I am going once around the entire waterfall. 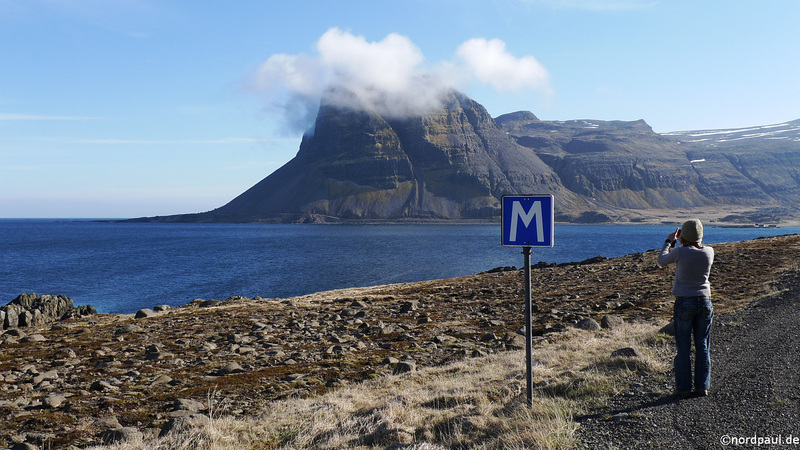 After the first days in Reykjavík, on the the Golden Circle and at the Eyjafjallajökull now I go to the Westfjords which is a new unknown area for me. 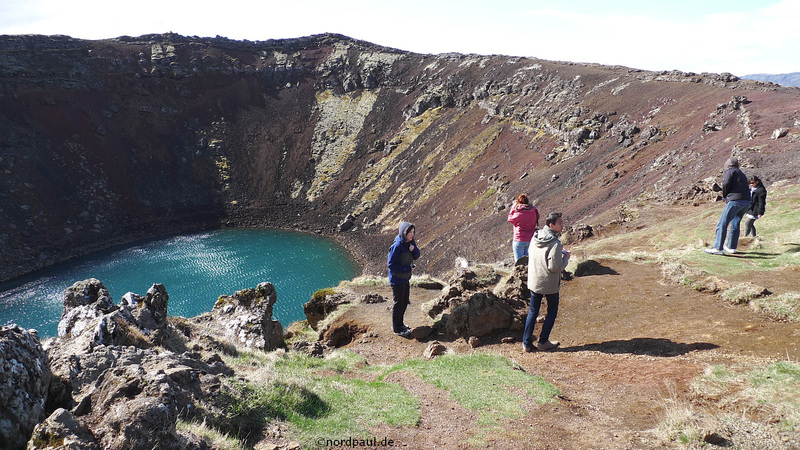 First we pass the Grábrók crater, later we see the wide fjord Breiðafjörður again and again. 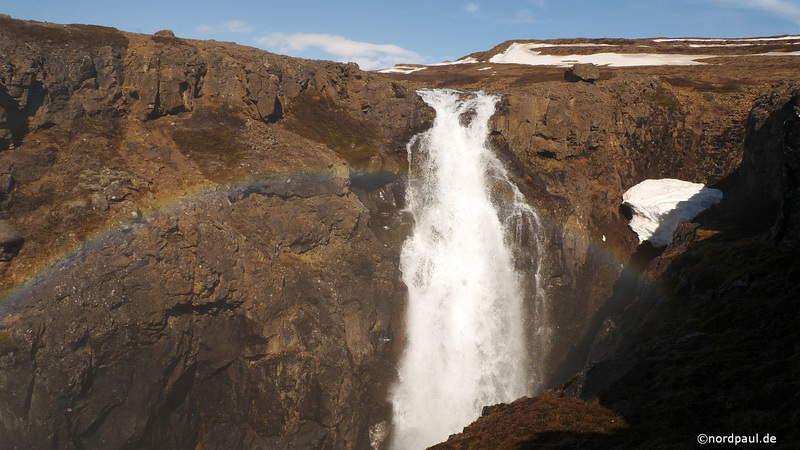 Finally after going through some snowfields we reach the waterfall Dynjandi. 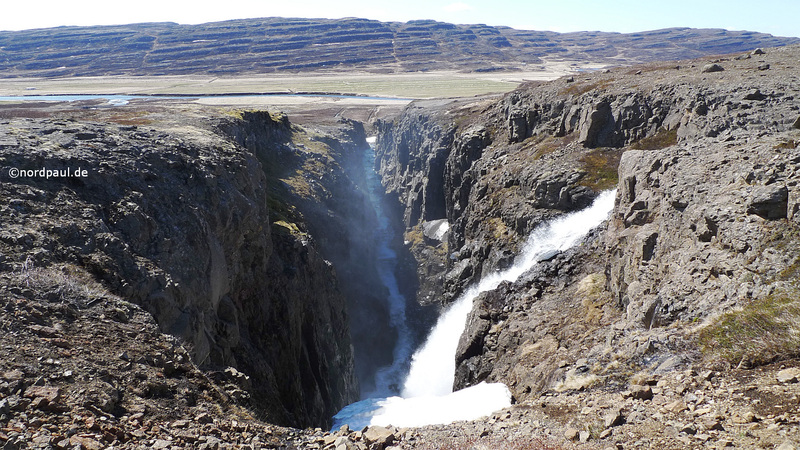 Five smaller waterfalls lead you to the foot of the 100 m high and wide fanned Dynjandi (also Fjallfoss). 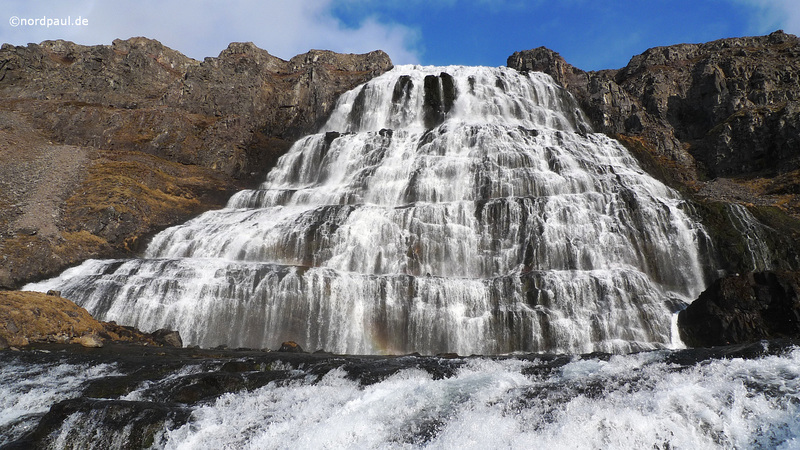 This is a very special perspective from below on the waterfall cascades. 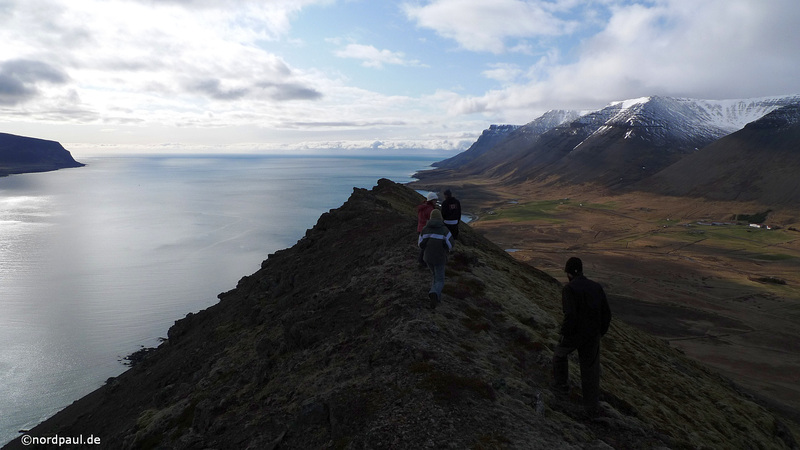 The Westfjords (Vestfirðir) are a very rugged and mountainous peninsula in northwest of Iceland. 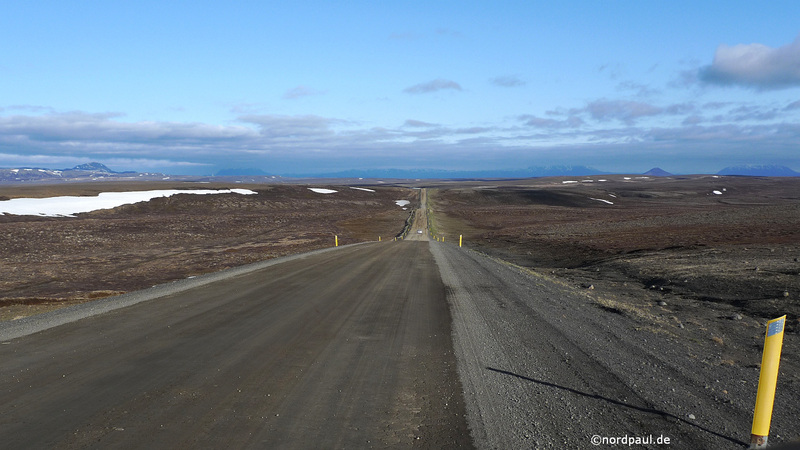 The region is relatively isolated (in the winter time many of the gravel roads are closed) and with 0.8 inhabitants per km² very sparsely populated. If you want to compare: in Great Britain there are 255 inhabitants per km², in the most sparsely populated country in the world (Mongolia) 1.9 inh. per km². 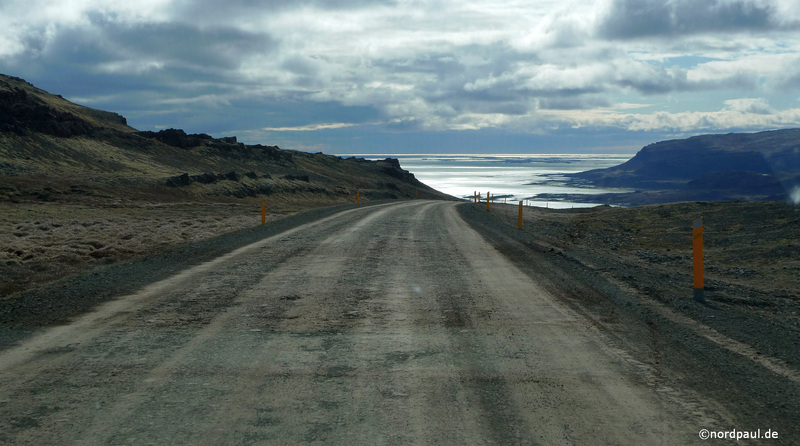 Only recently there is a continuous paved road from the capital Reykjavík to the main city Ísafjörður. 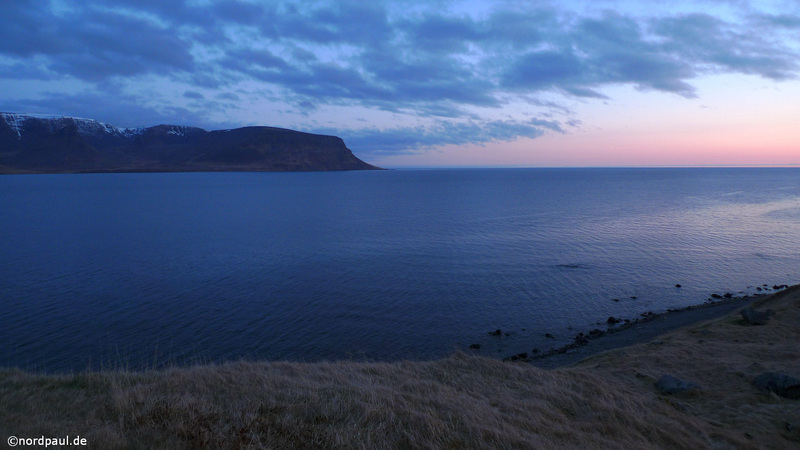 Because of the particularly untouched landscapes tourism is gradually increasing in the Westfjords. 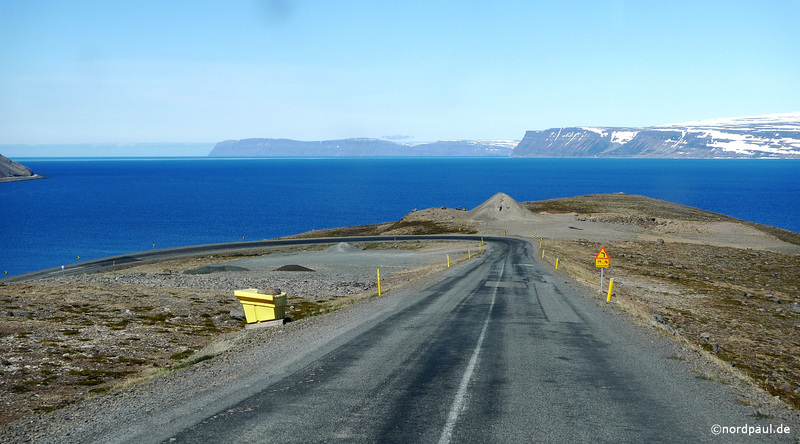 The ride from Reykjavík in one of the middle Fjords (Dýrafjörður) takes us with some stops about ten hours. 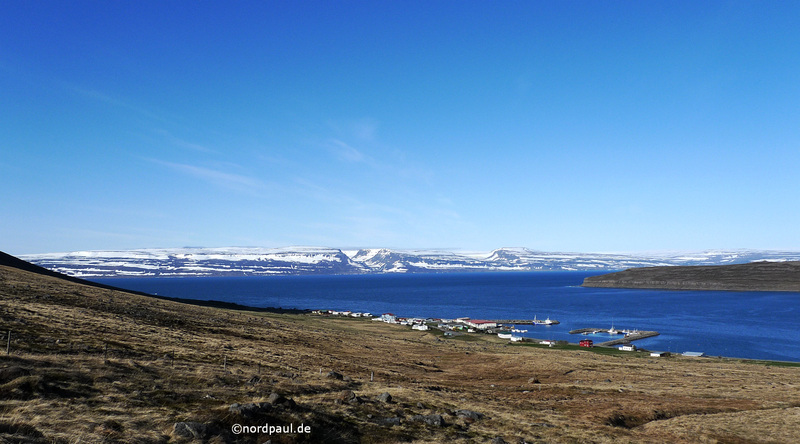 After two nights in Núpur in the Dýrafjörður the journey continues to the southeast of the Westfjords to Hótel Laugarhóll. For two weeks I am a happy part of an international volunteer work camp at the Hótel Laugarhóll in the Bjarnarfjörður (Bear Fjord). 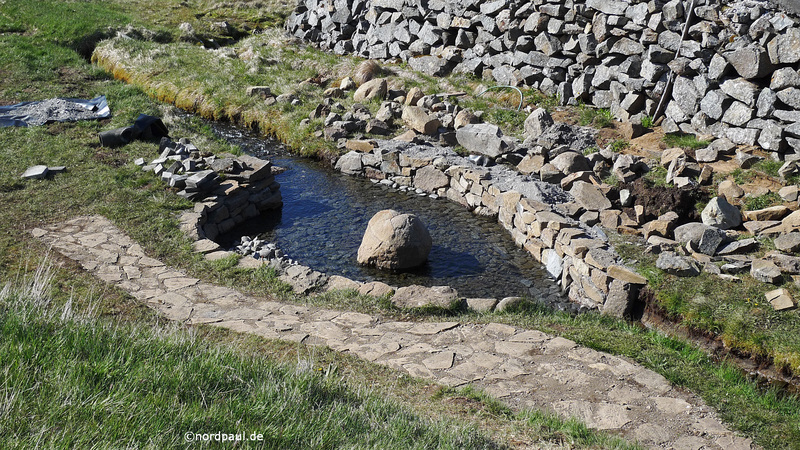 We remodel the outdoor areas - particularly the hot spring and the warm brook. Lodging and meals are for free. We cook for ourself. Prior the work camp you already pay the costs of travel and an administrative fee. 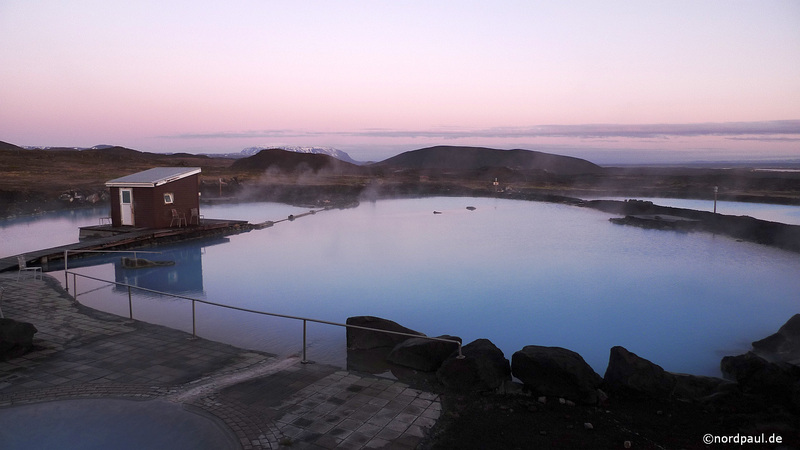 So the camp makes you not richer of money, but in experience, language practice, the horizon and in becoming acquainted of the Icelandic everyday life. 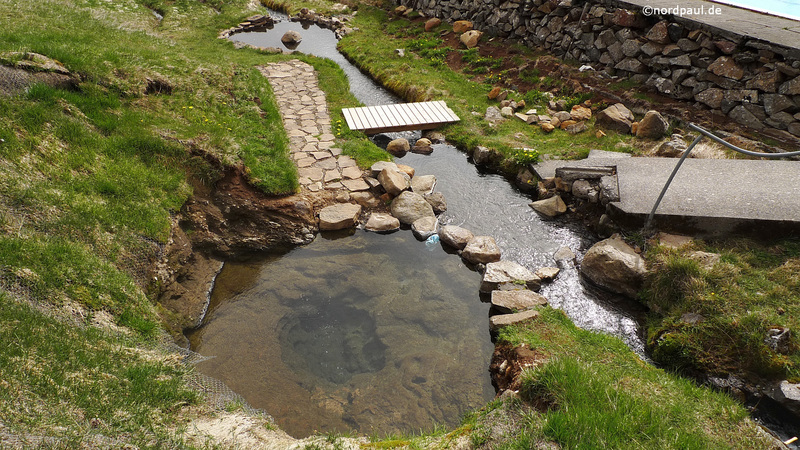 At the Hótel Laugarhóll you find the hot spring Gvendarlaug, in which people of the Saga time had a bath. Today the water is too hot in there. 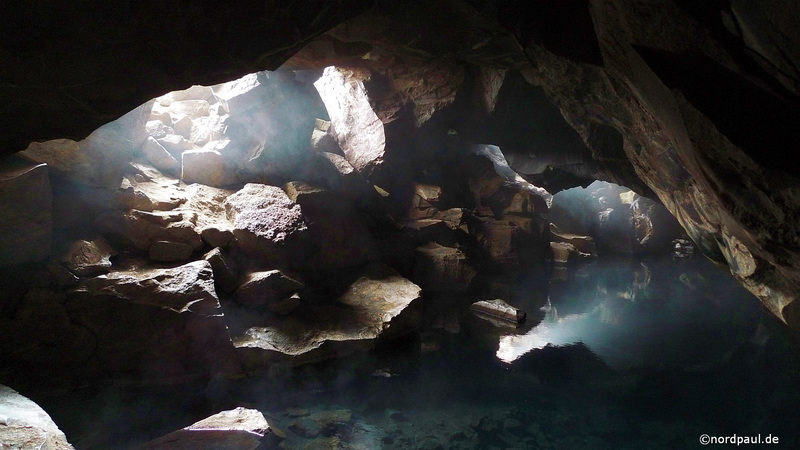 So better go into the rugged thermal spring or in the natural warm swimming pool. 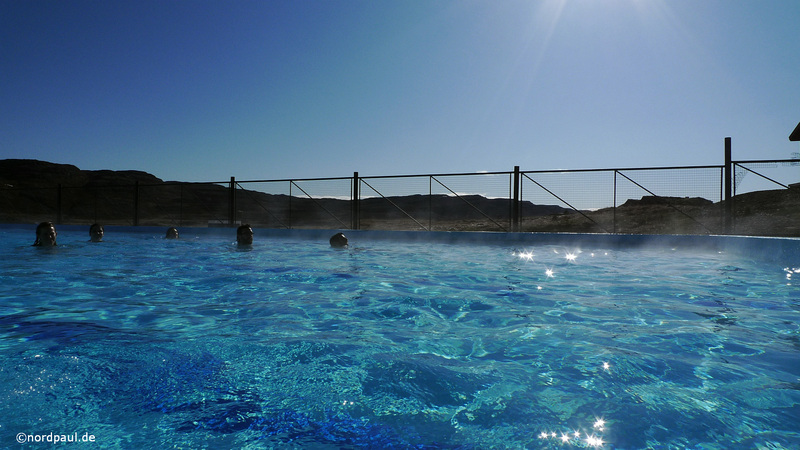 And because it is so pleasant, I am relaxing every evening for two or three hours in the warm water. Sometimes also until midnight because it is not getting dark at night in May. Like in paradise! 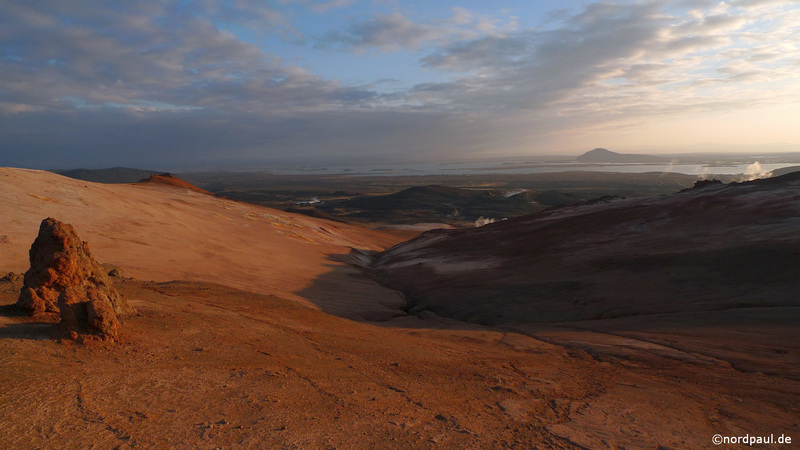 During the leisure time or weekends we hike through the harsh environment. 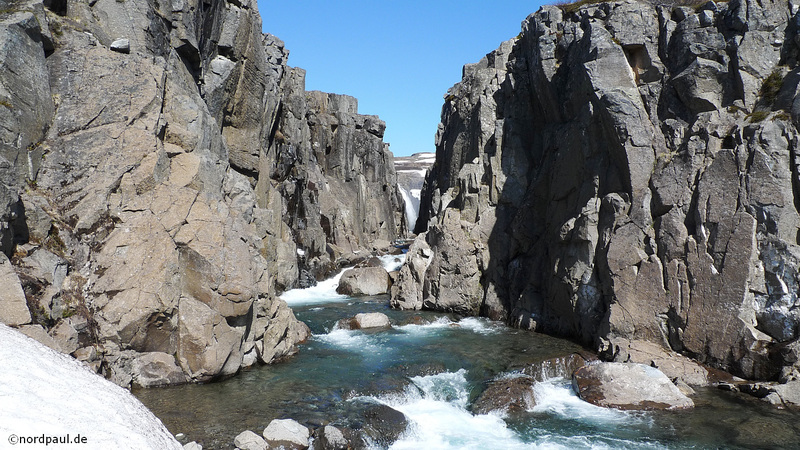 There is a river falling in a crevice and washing it deeper and deeper. 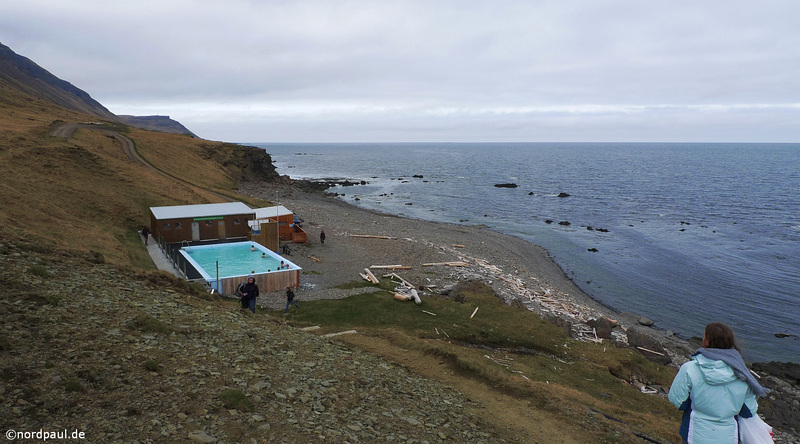 Further north on the east coast of the Westfjords we go to Krossnes which is the next warm pool - in the middle of nowhere, but right on the coast line of the Atlantic Ocean. But what makes so much fun for a physically demanding work camp in your own holiday? 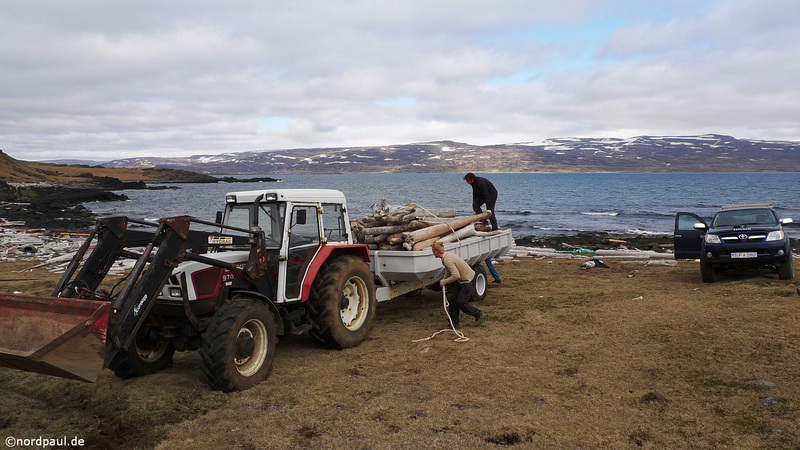 For example collecting driftwood under the open sky with fresh air on the Atlantic coast. 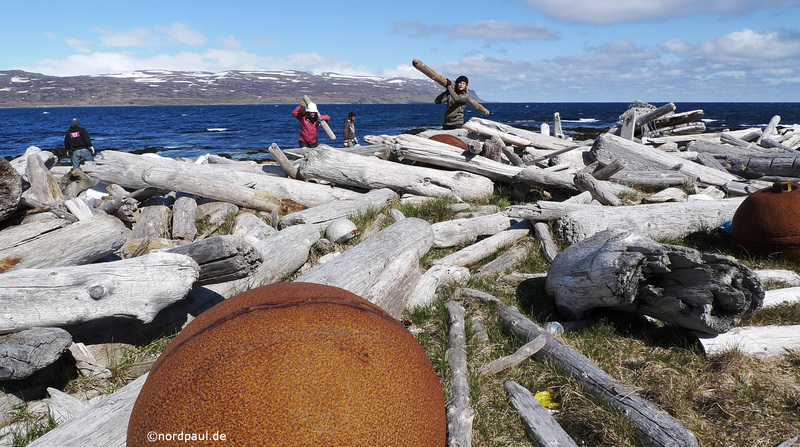 Driftwood which has entered the Arctic Ocean in Siberia some decades ago. 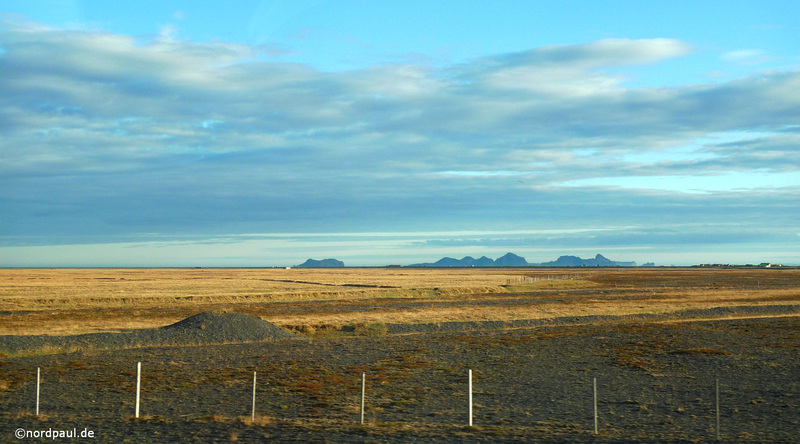 Iceland has nearly no forests. However you find many wooden houses. 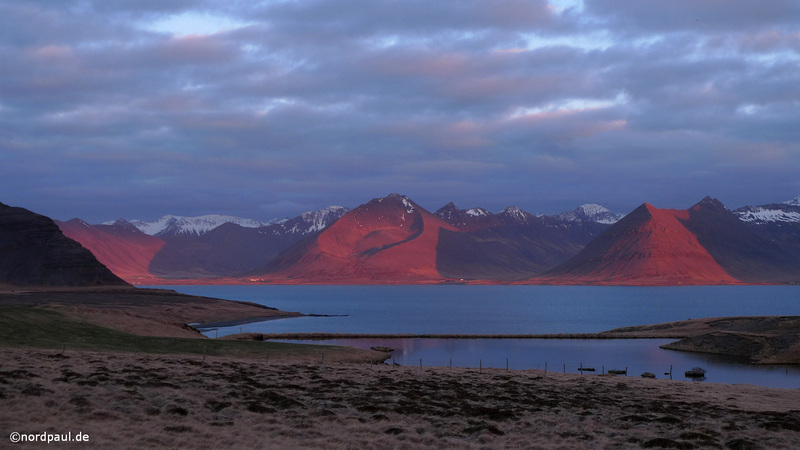 After the wonderful time with the great volunteers and locals I say goodbye for going to the airport in Ísafjörður. 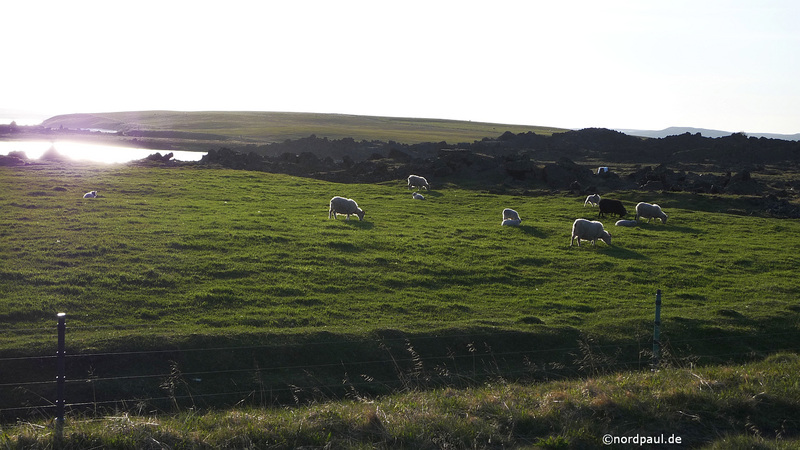 Because of the many branches which a part of the Ísafjarðardjúp it takes us 100 minutes in the car for only 25 km air-line distance. 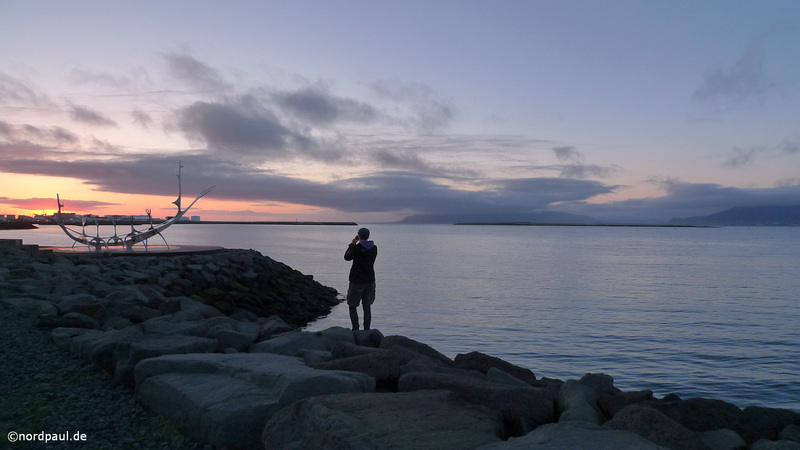 The night before my flight I sleep in Súðavík. 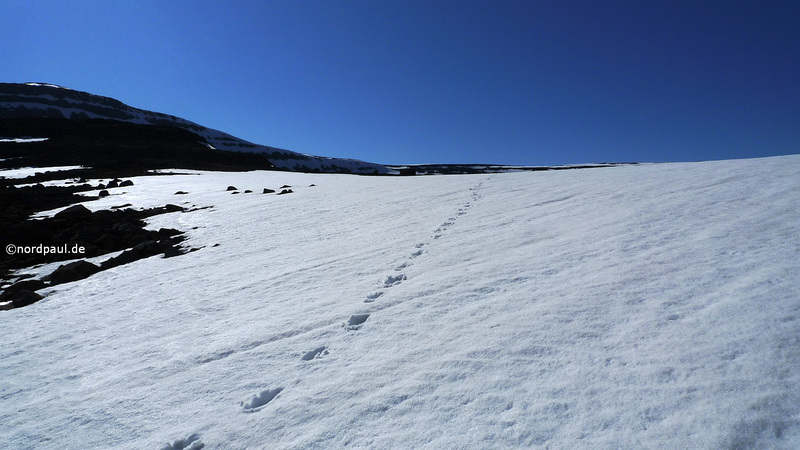 Also I am walking up the valley Sauradalur to the snow line. 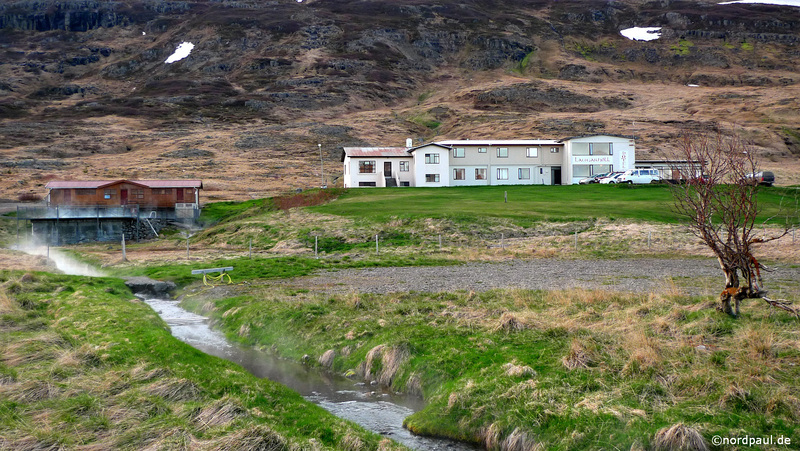 Finally I recommend you a visit to the Arctic Fox Center (in Icelandic Melrakkasetur) in Súðavík. 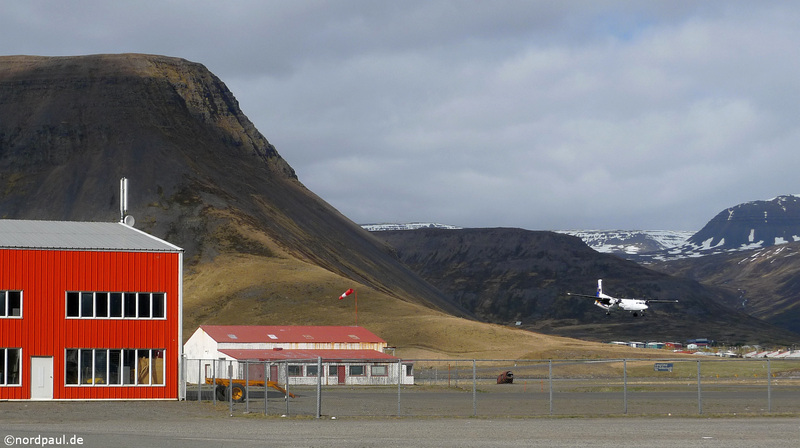 From Ísafjörður (due to its location between the mountains it is said to be one of the most dangerous airports in the world) I fly via Reykjavík to Akureyri in the north of the island. 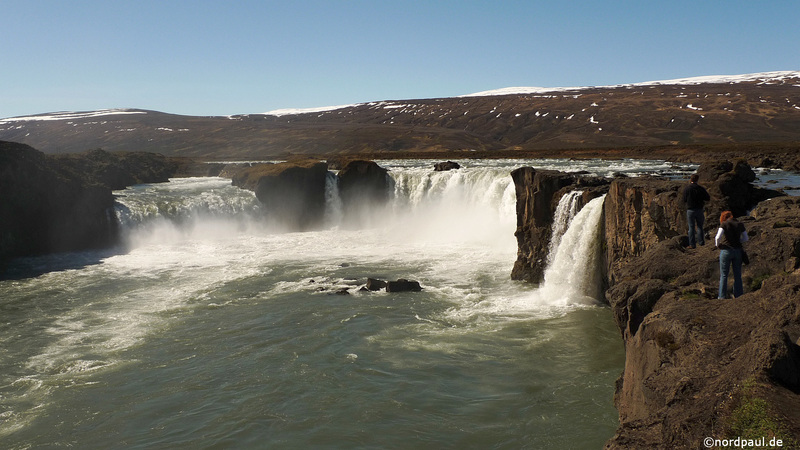 Then I drive by car to the 12 m deep and 30 m wide Goðafoss (Gods waterfall) and later to the lake Mývatn (midges lake) which is in average just over 2 meters deep. 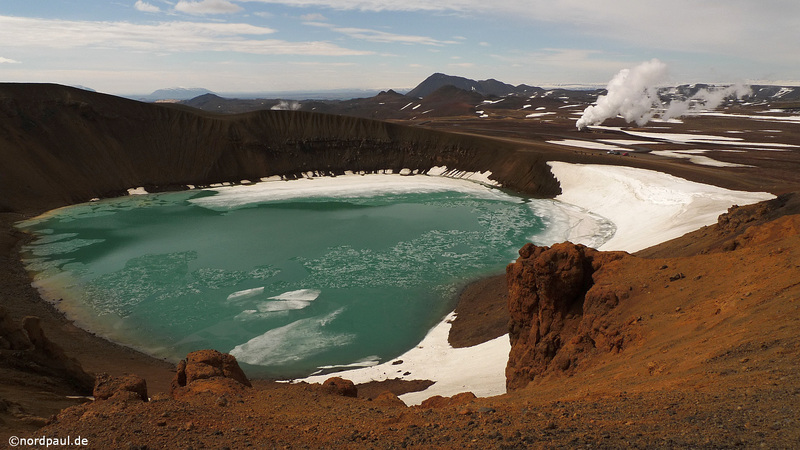 Lake Mývatn is well known for the great diversity of lava formations, such as the tufa formations of Dimmuborgir. 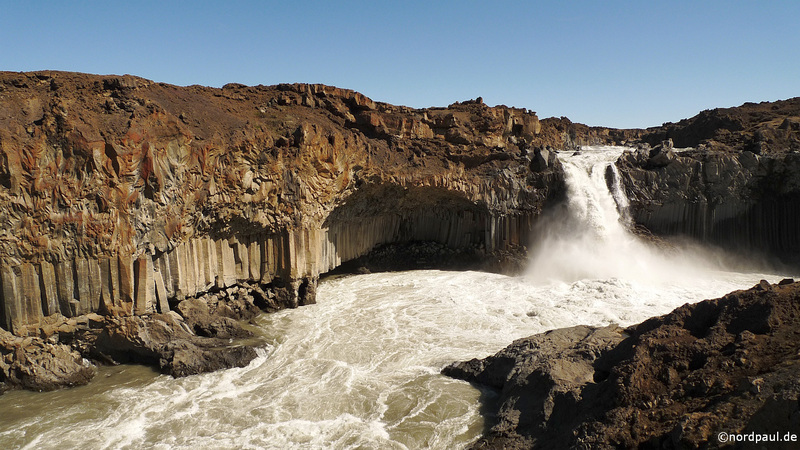 They were formed 2000 years ago when lava flowed over a swampy area and parts of the evaporating water could freeze the lava, while others still boiling lava flowed away. 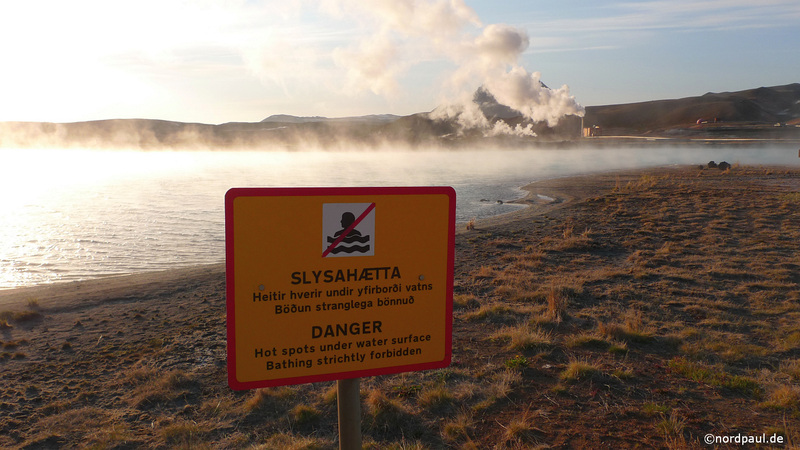 The volcanic activity around the lake is still going on. 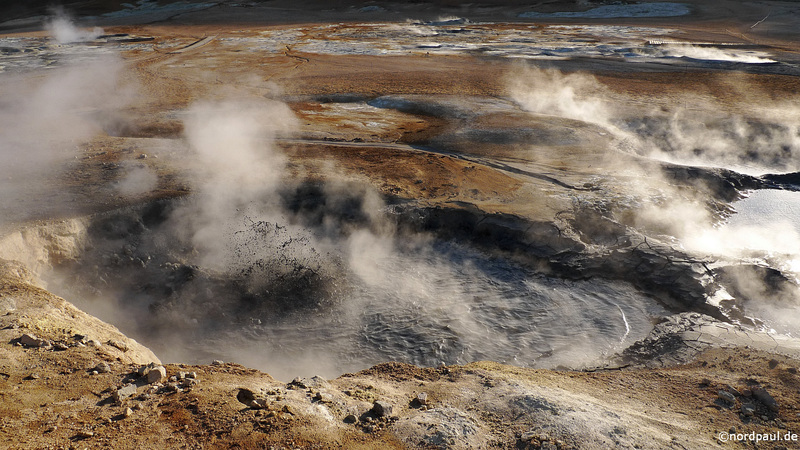 The last eruptions of the central volcano system Krafla were until 1984. 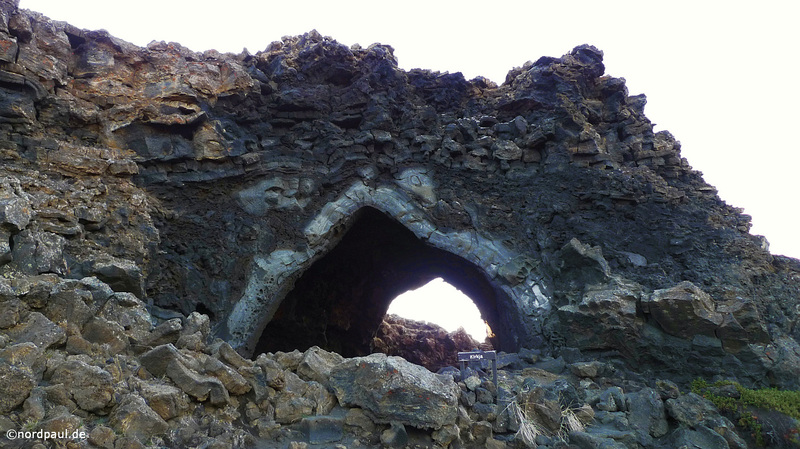 It were not the last eruptions. 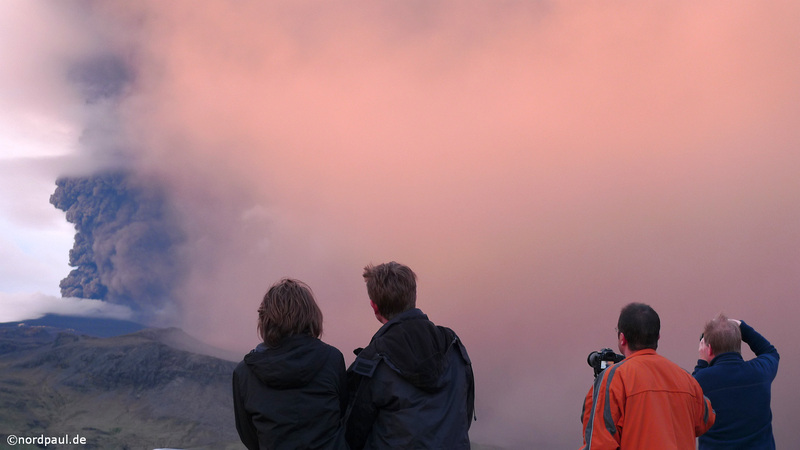 On the volcano Mount Námafjall I feel the warmth of the earth under my feet. 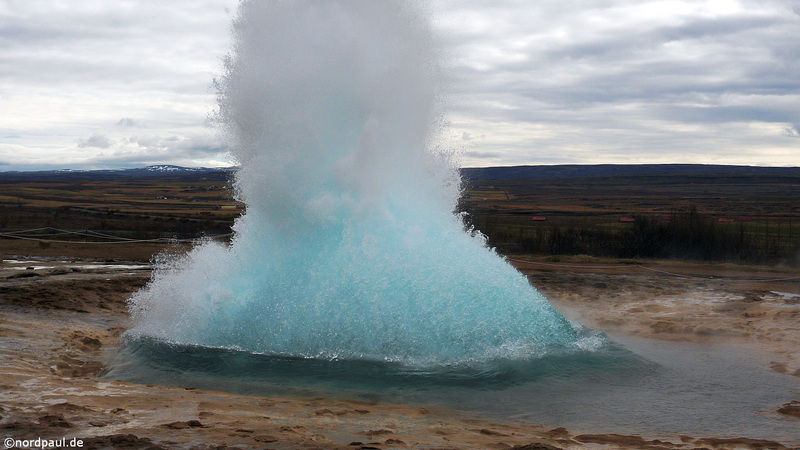 Volcanism means also hot water. 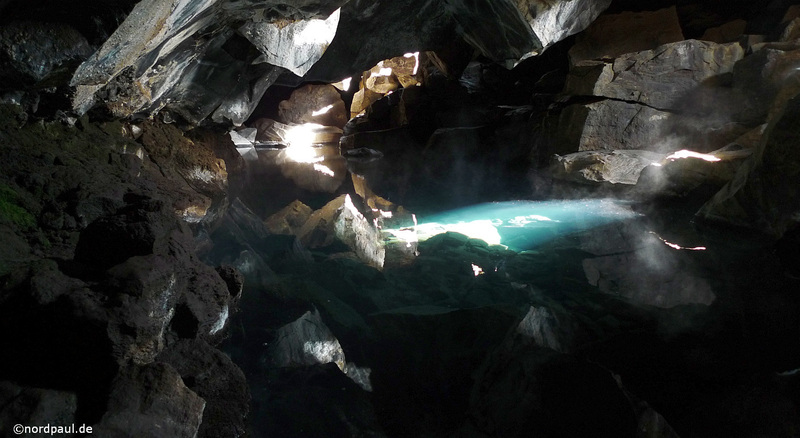 The former swimming grotto Grjótagjá is an impressive proof of this. 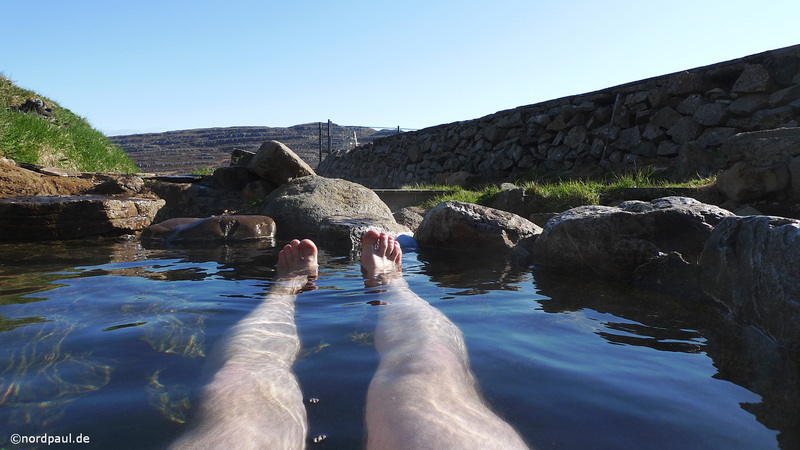 Due to the rise in temperatures (50°C) the spring is described in many guidebooks as no longer suitable for bathing. 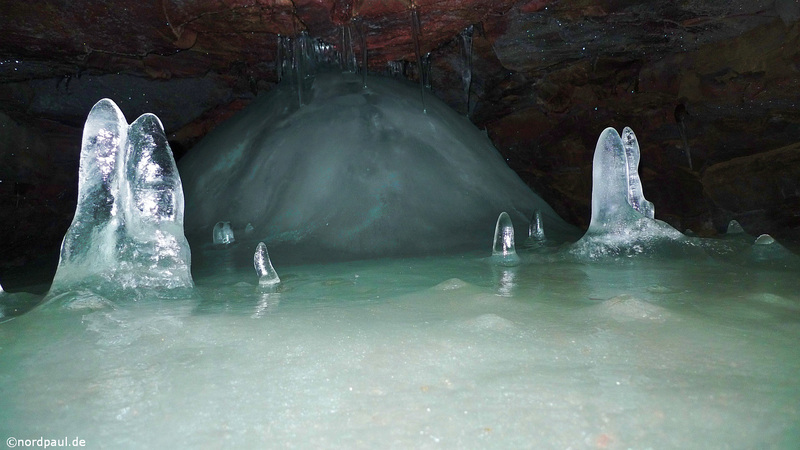 In summer 2010 the water in the southern part of the cave is already good for a short bath. So also in the evening when it is drizzling a little time. 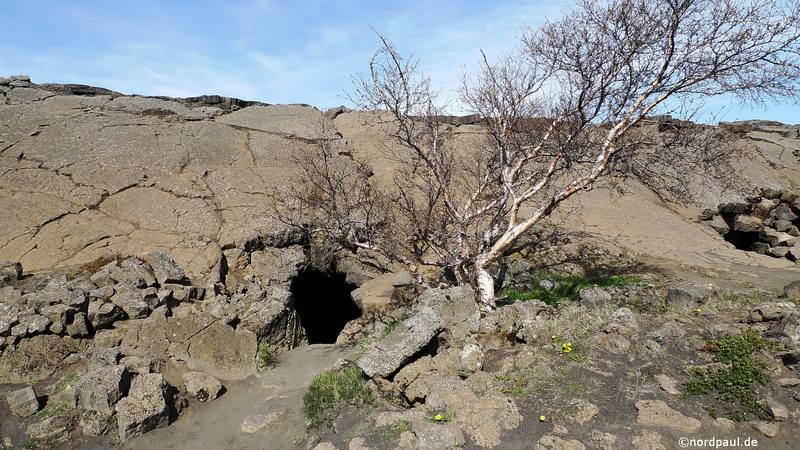 The crevice is visible along the cave which separates the Eurasian continental plate by the American one. Swimming between the continents. 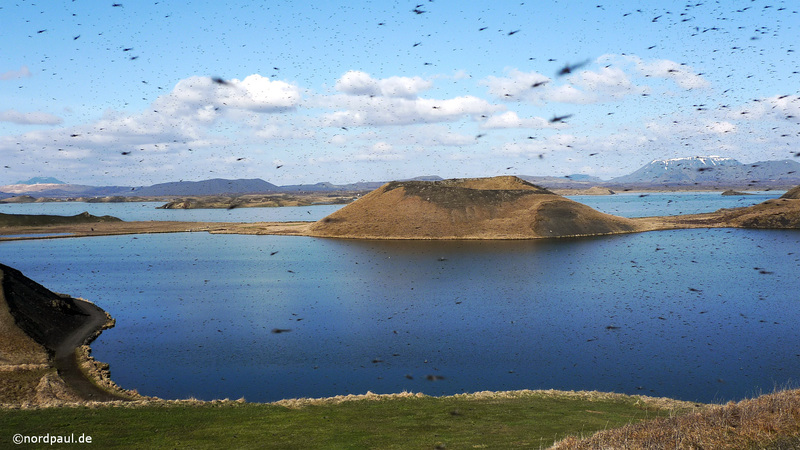 The crater Víti originated during an outbreak in 1724. 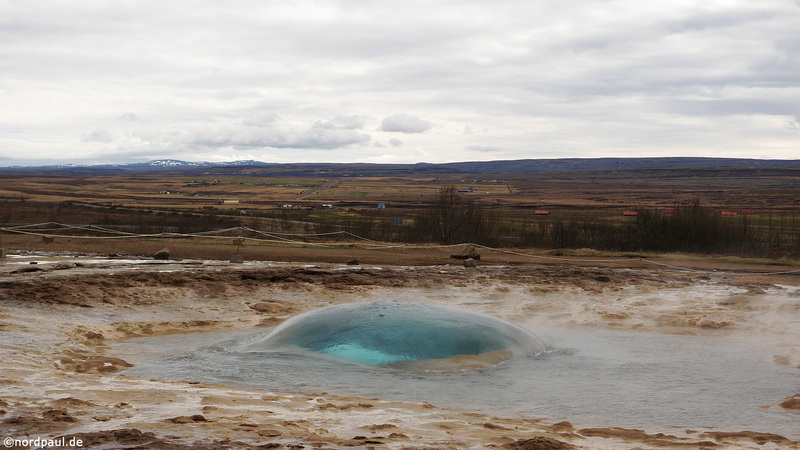 Today there is a maar inside which has its turquoise color of silica algae. 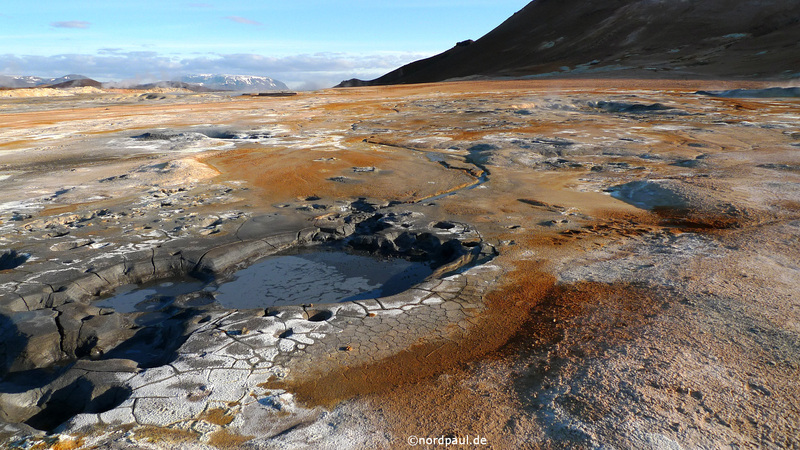 Later in 1984 the Krafla volcanic system has again been very active. 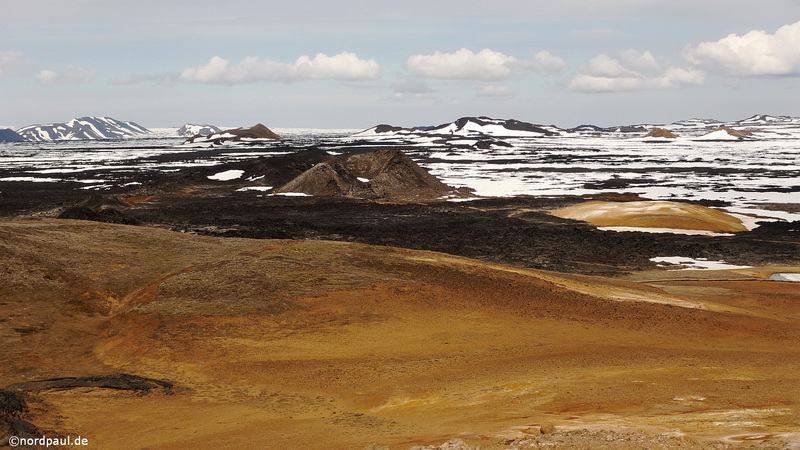 New black lava contrasts the usually yellow-colored surface of the volcano Leirhnjúkur. 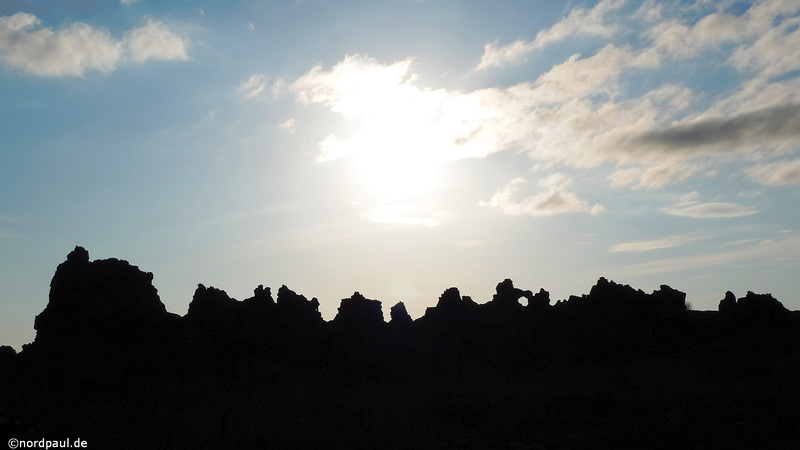 The lava fields are still hot and steaming in 2010. 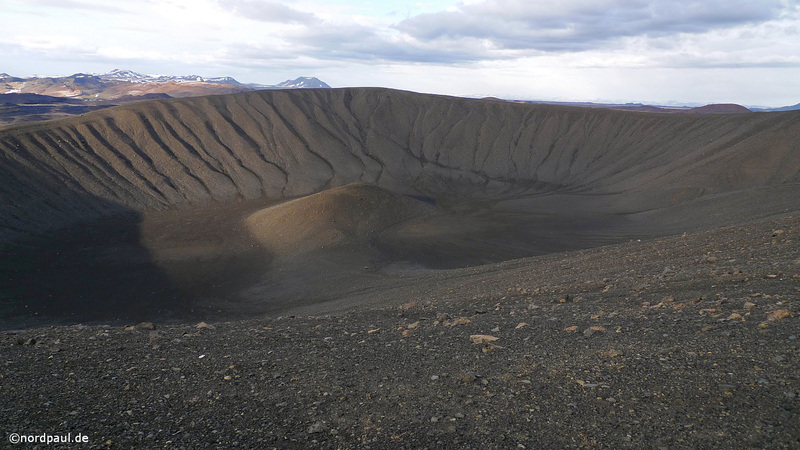 The gray Hverfjall explosion crater (or Hverfell) on the eastern shore of lake Mývatn is a large tuff ring. 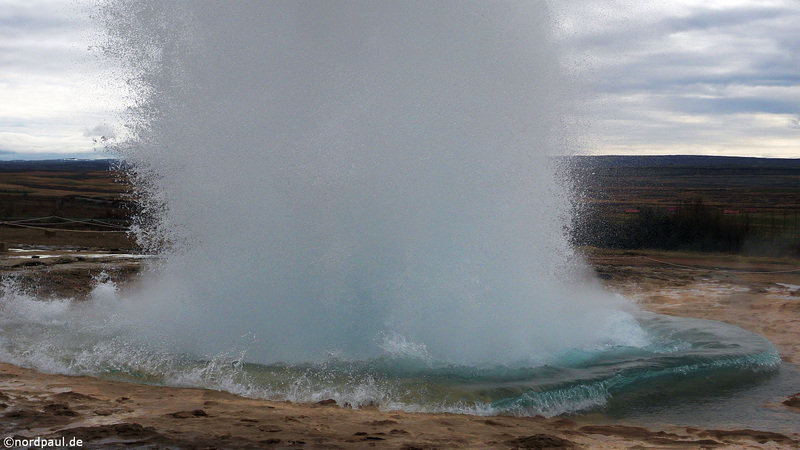 It was formed 2500 years ago when magma met groundwater for a massive steam explosion. 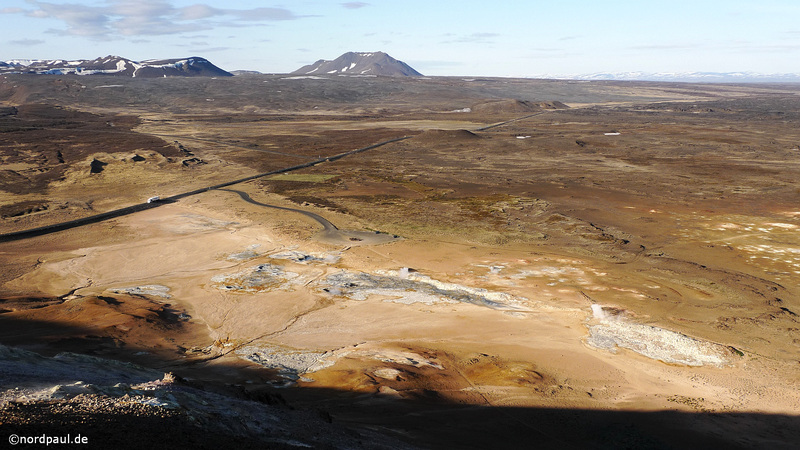 Hverfjall belongs also to the Krafla volcano system. 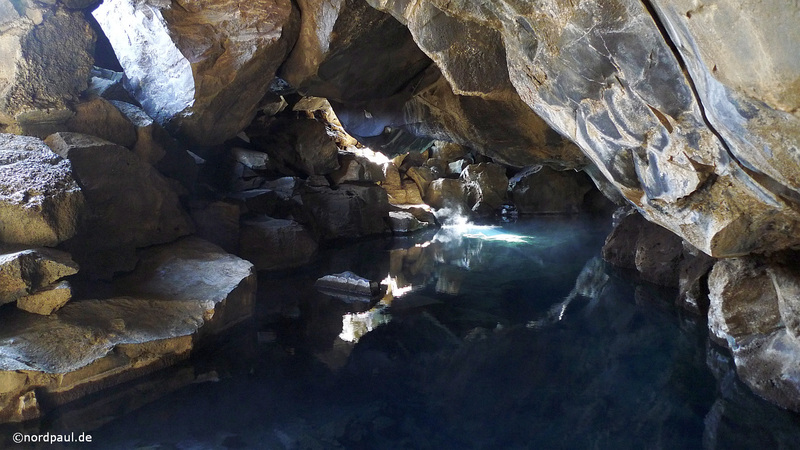 Before my trip to Iceland I read something about a lava ice cave called Lofthellir. 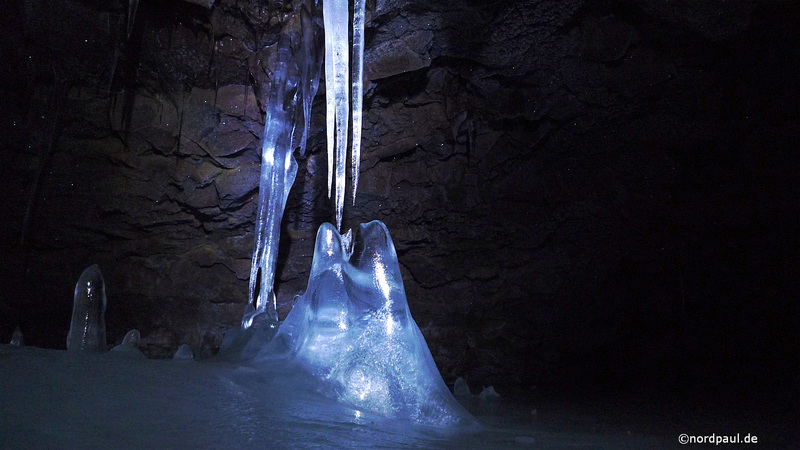 It was just discovered in 1984 by an aircraft in the large Laxádalslava. 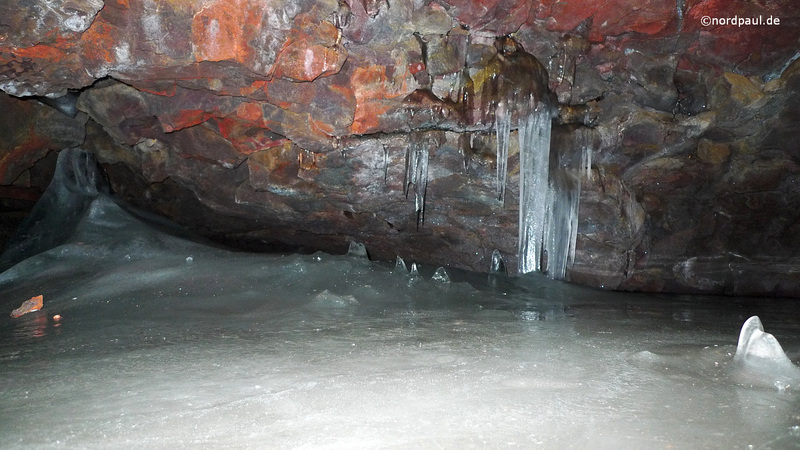 This relatively unknown cave I like to visit now. 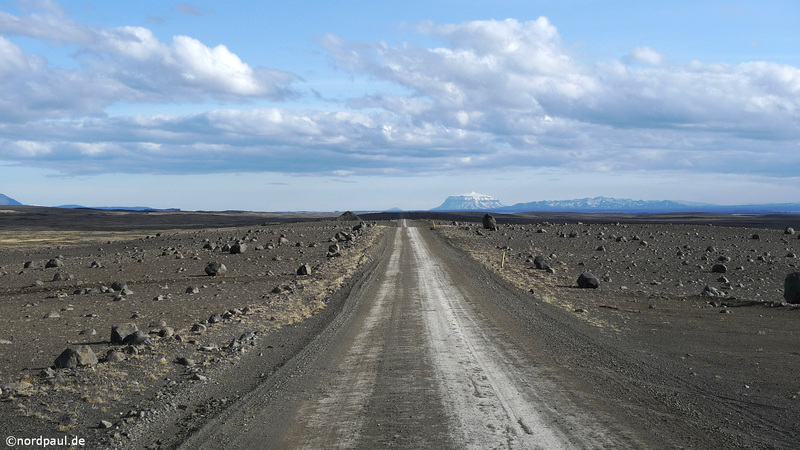 On a cloudy day I borrow a bicycle and ride on lava tracks further and further away from the civilization. 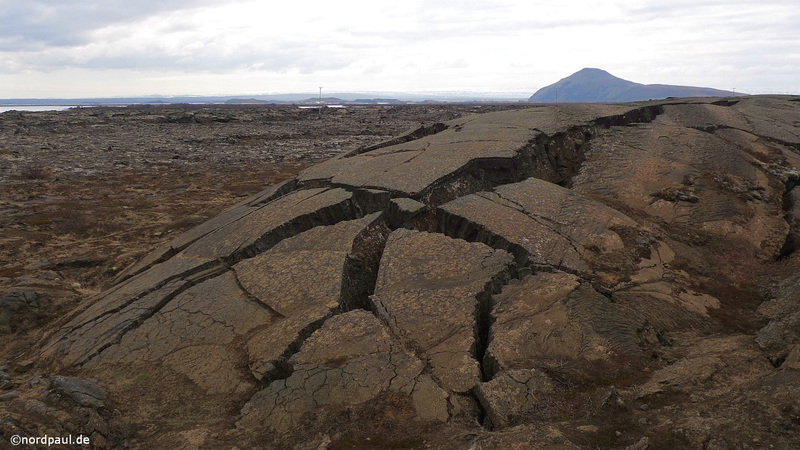 Hoping all the time that it does not rain, that the rickety rental bike will survive and that I also will find the cave in this huge lava field. I have no detailed map and know only approximate location descriptions. 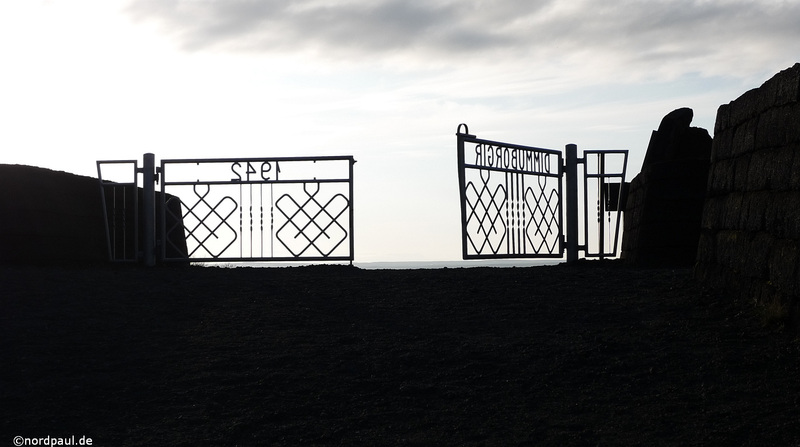 When I reach after two hours of cycling the lava field, the trail ends. Now the real adventure will begin. 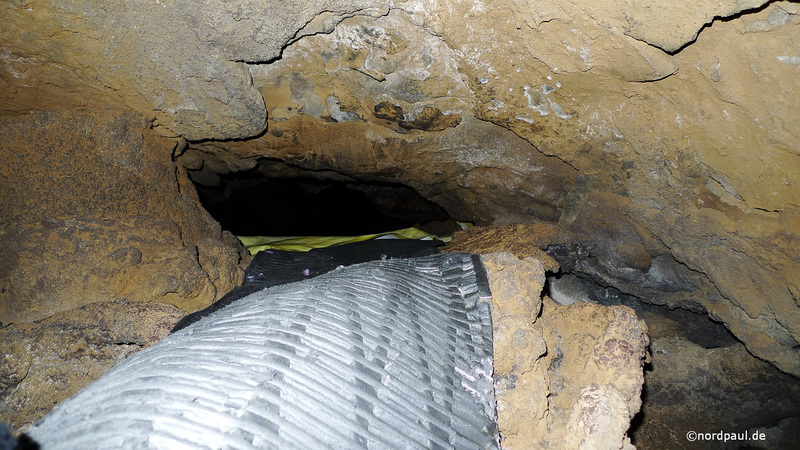 I am walking and looking at the mile-wide area for the cave entrance. Everything looks the same. After one hour I want to go back to my bike. 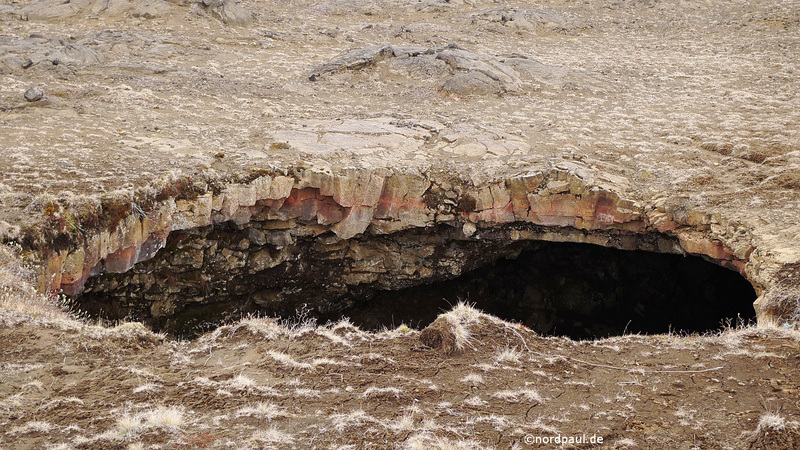 But then I stumble completely random upon a hole in the earth. Thank you! I climb down a ladder to the ground floor. 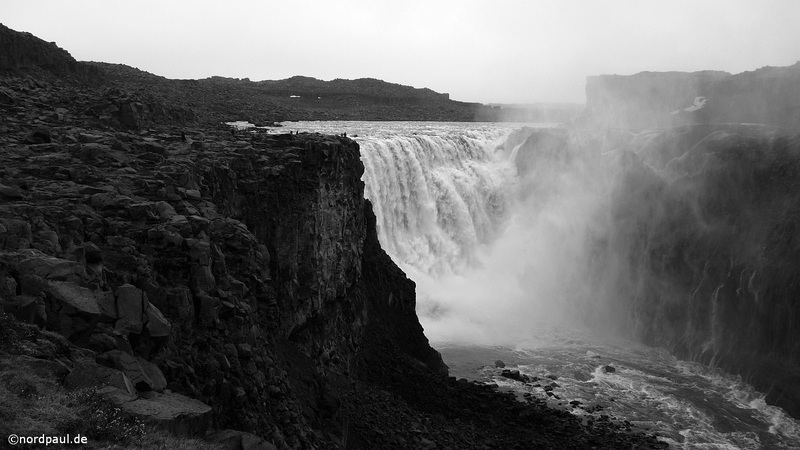 Then I crawl through a very narrow gap into the total darkness and silence. I only hear my blood when it is pumped through my ears. It is incredibly, almost unbelievably here downstairs. After 45 minutes I am back out there. What an experience! 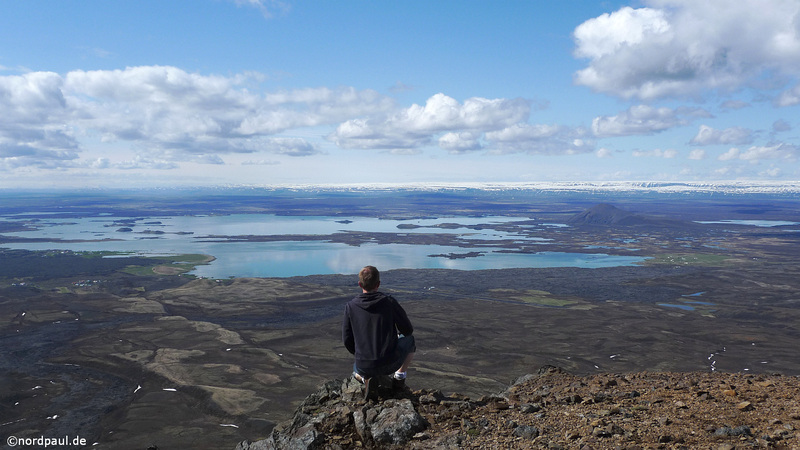 One week at lake Mývatn is not enough. 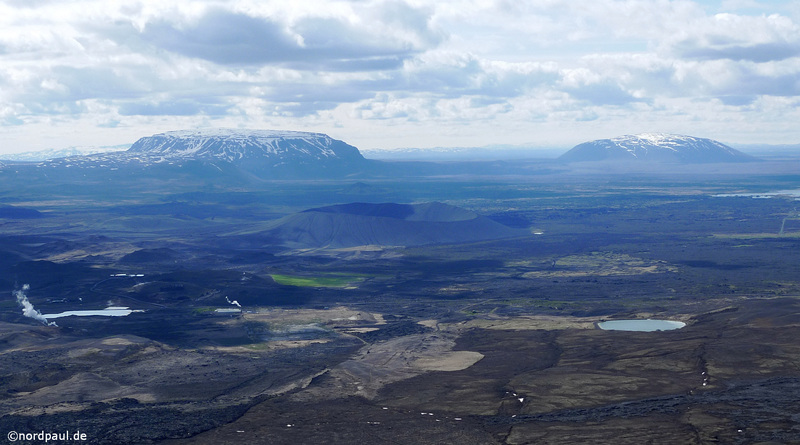 I am going to the northeast direction into the mighty valley Jökulsárgljúfur. 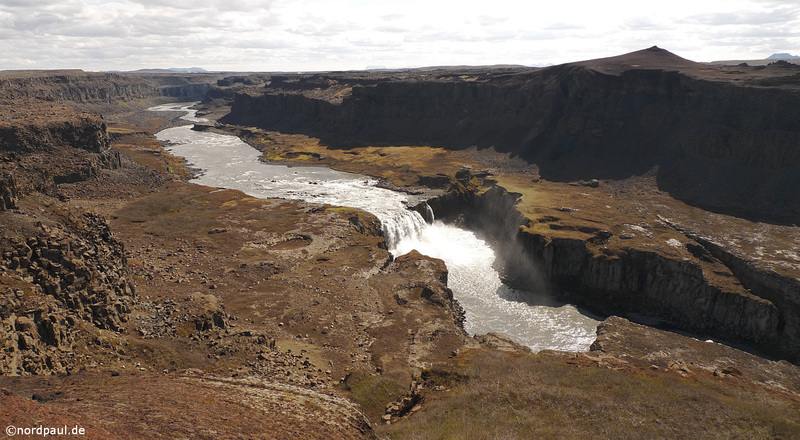 Here the river Jökulsá á Fjöllum plunges down the Dettifoss. (More details later.) I ride on seemingly endless gravel roads farther and farther north and on the other side of the valley back to the south again. 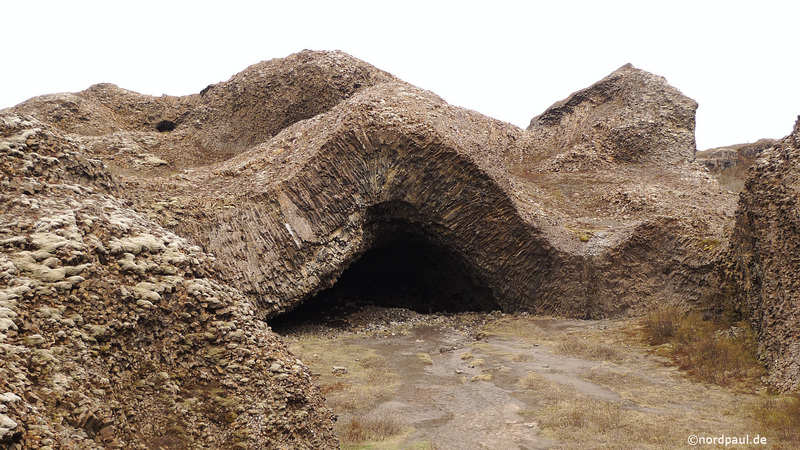 In the Vesturdalen I see the Hljóðaklettar (Echo Rocks) such as Karl and Kerling or Kirkjan (church): many hexagonal basalt rocks. 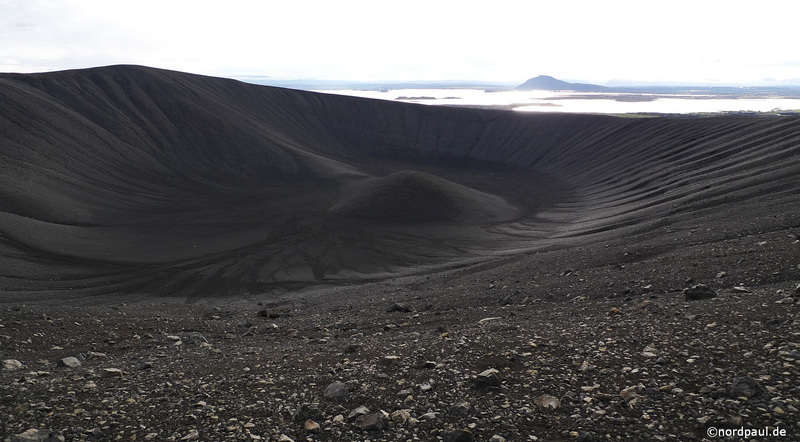 Other possibilities in the region: I climb the 771 m high Hlíðarfjall in the morning, write something in the summit book and enjoy the view on the approximately 500 m deeper lying lake and all the craters and lava fields in the vicinity. 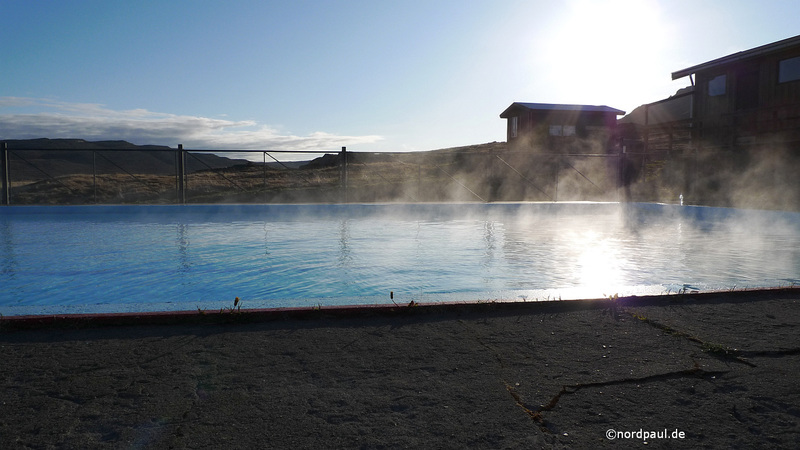 In the evening I go to the Mývatn Nature Baths, a small Blue Lagoon. 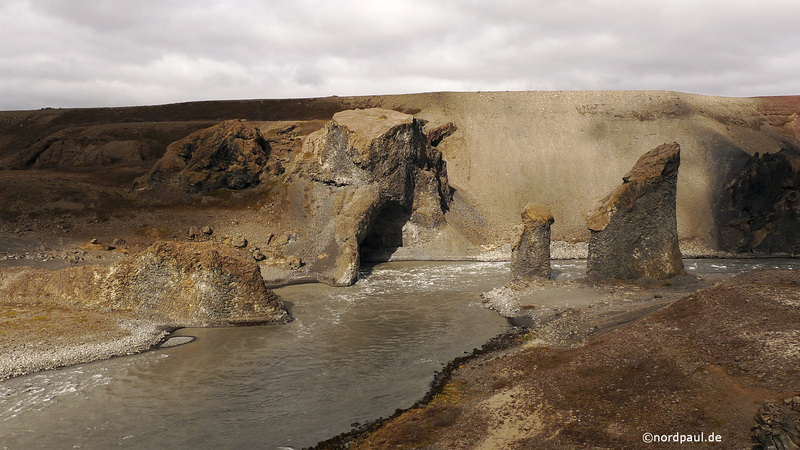 The river Jökulsá á Fjöllum flows in the surreal seeming basalt valley Jökulsárgljúfur over three consecutive stages toward the Arctic Ocean. 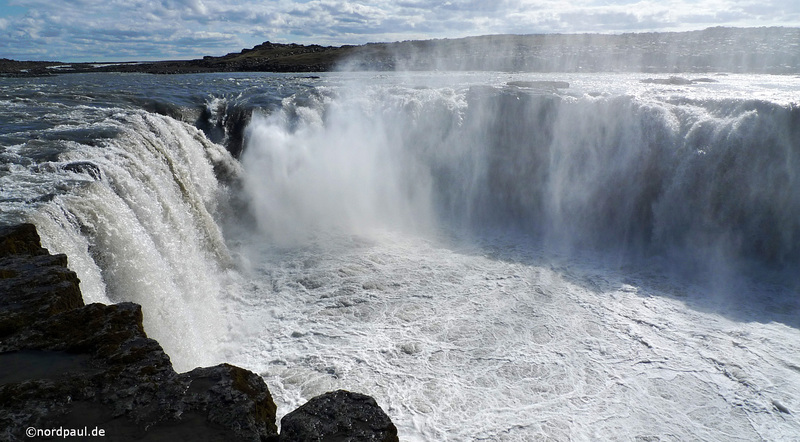 First the water falls on Selfoss 10 m in depth. 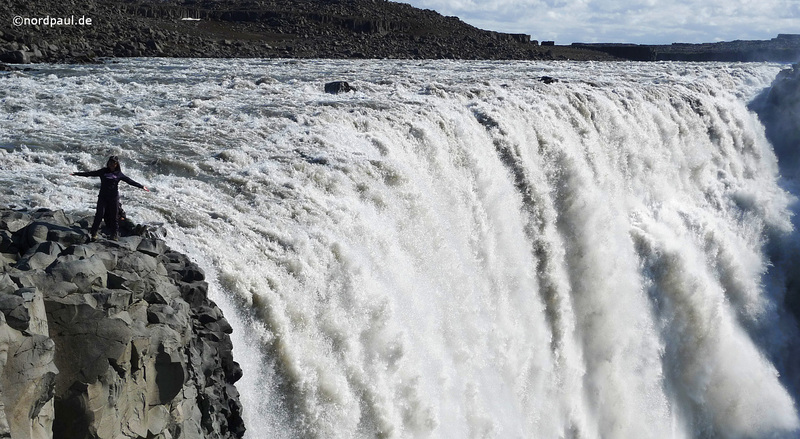 The waterfall edge is moving further and further upstream. 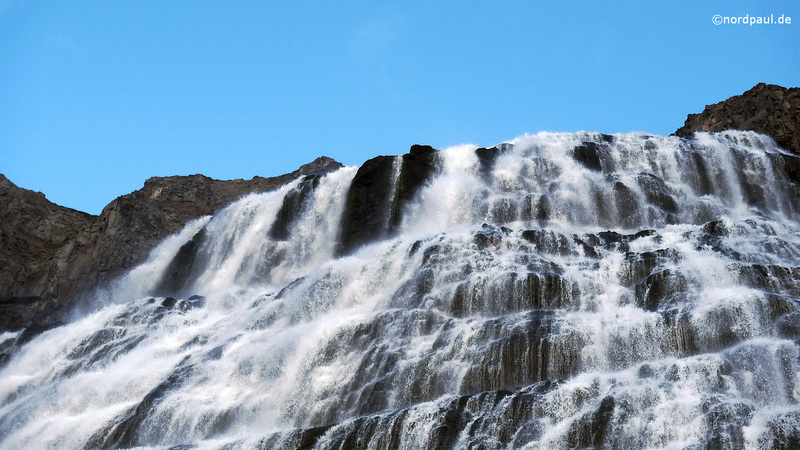 After one kilometer you see and feel the most water-rich (highest energy) waterfall in Europe. 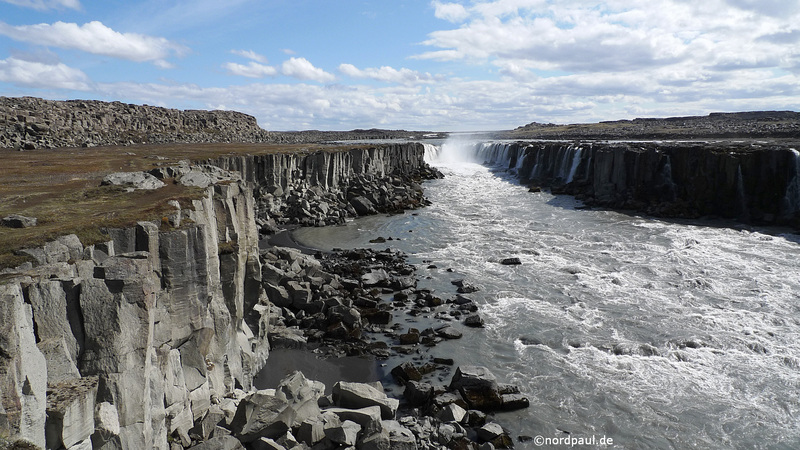 The Dettifoss has a width of 100 m, a case depth of 45 m and an average flow of 193 m³/s. Much noise and spray is guaranteed. 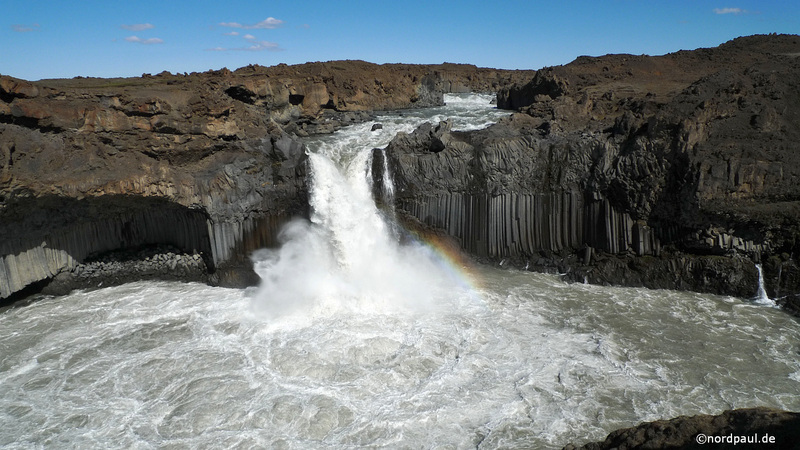 After two kilometers the water flows into the third waterfall, the Hafragilsfoss with a depth of 27 m.
East of the Mývatn the high temperature area Hverarönd is situated at the base of the active volcano Námafjall. 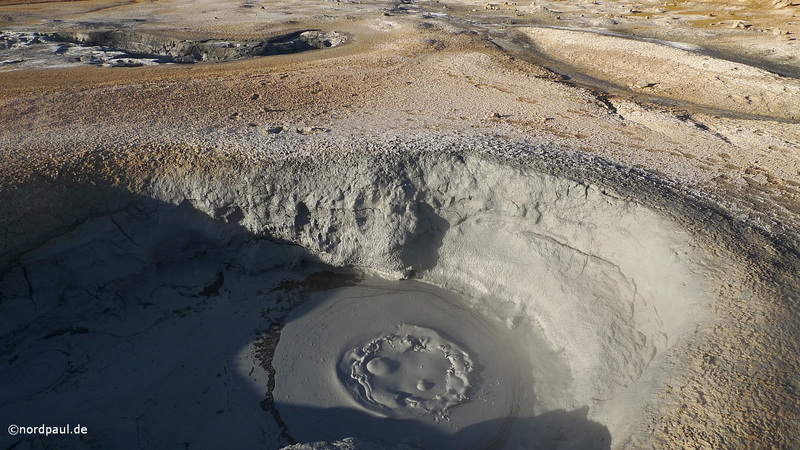 About 200°C at 1000 m depth is activating various steam and mud pools at the surface of the earth. 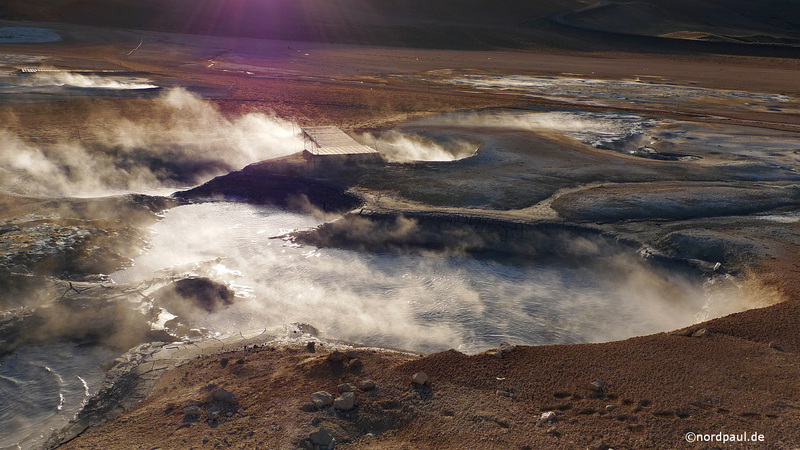 Solfataras are shooting sulfurous steam, fumaroles mostly only water steam, while mud pots are connected with ground water and are bubbling all the time. 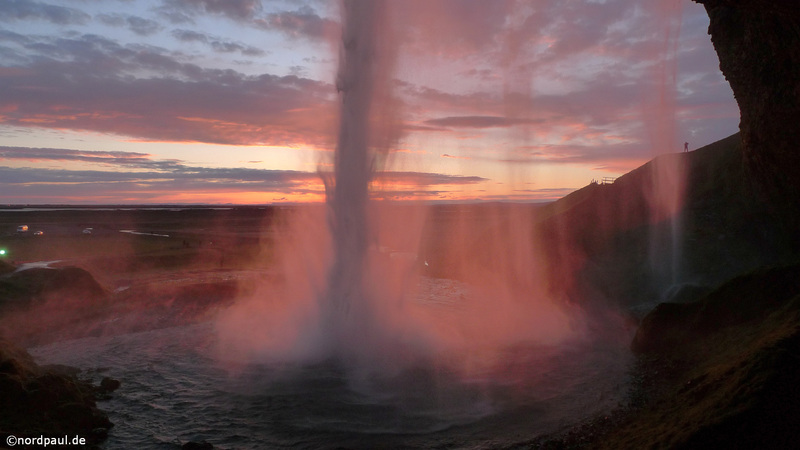 A variety of natural phenomena. After three and a half weeks the journey is almost over. 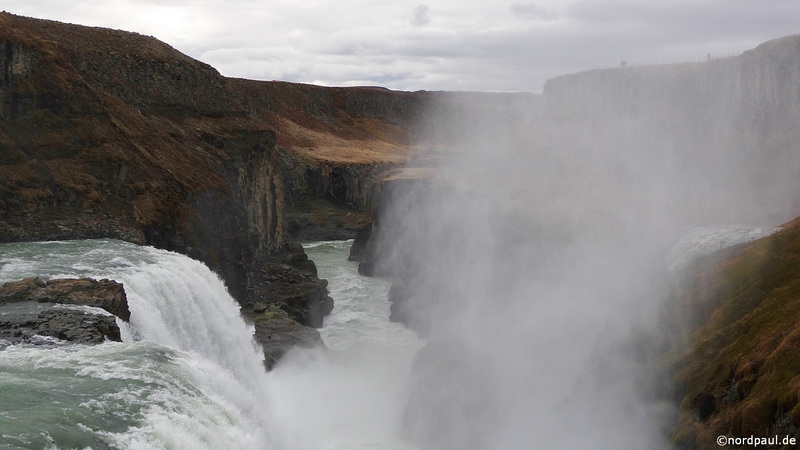 I pass the Goðafoss again. 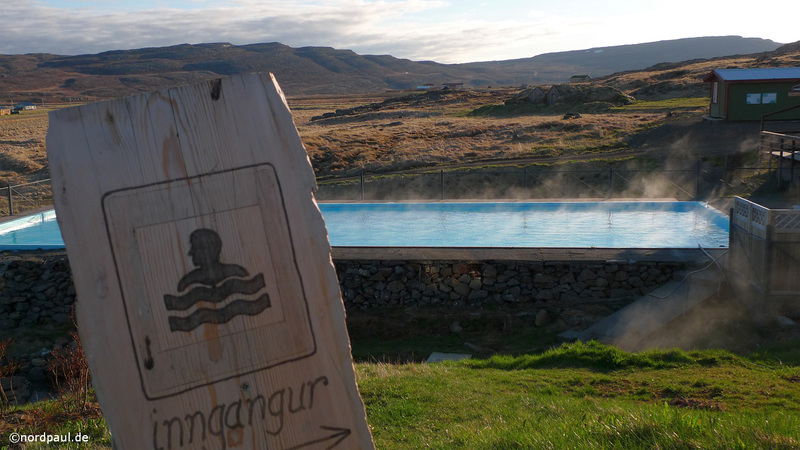 And I decide to have a half-day excursion into the highlands to the northern end of the Sprengisandur track. 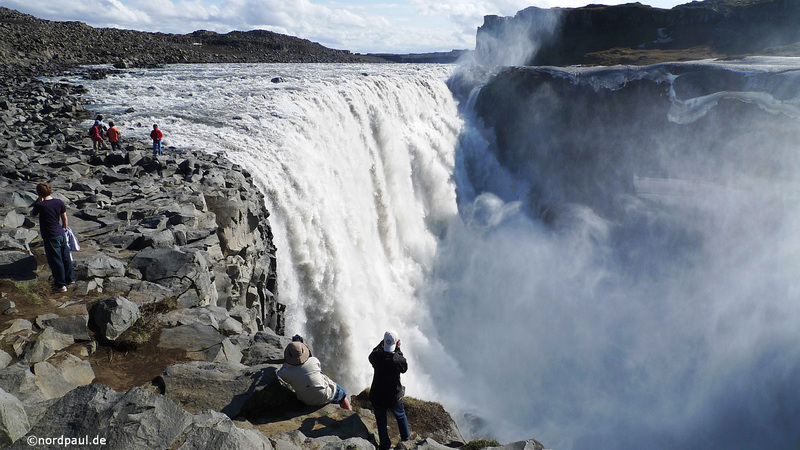 There I marvel at - in my opinion - the most beautiful waterfall in Iceland: the Aldeyjarfoss. 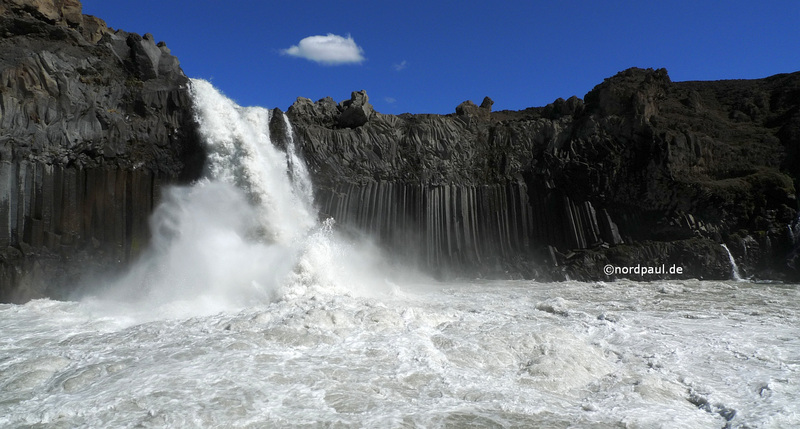 The river Skjálfandafljót flows over the black basalt columns white in front of a blue sky churned in the 20 m depth. 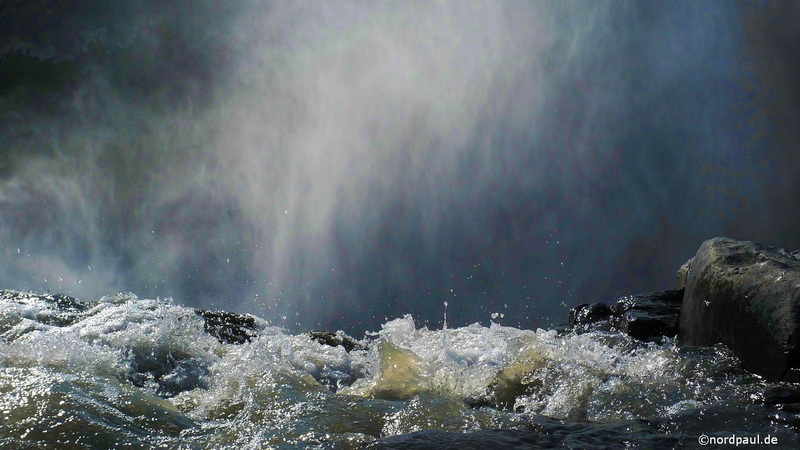 I am lying in front of the fall and feel the deep bass of hydropower. 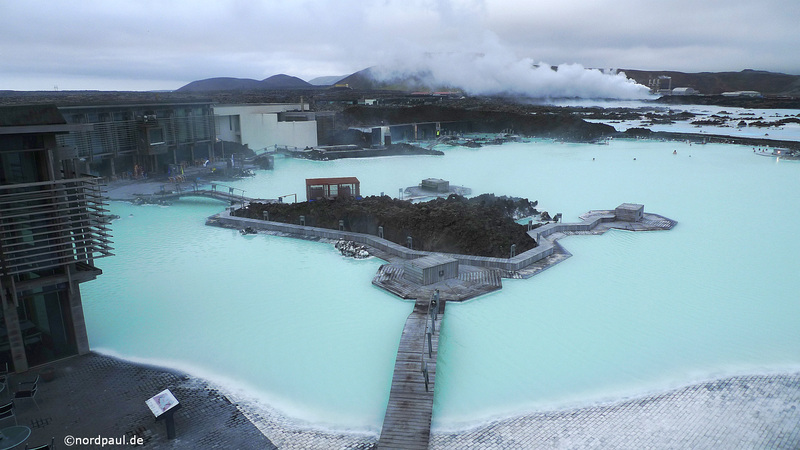 Later I spend the evening before my night flight for a few hours in the Blue Lagoon - enjoy one last time thermal heat. 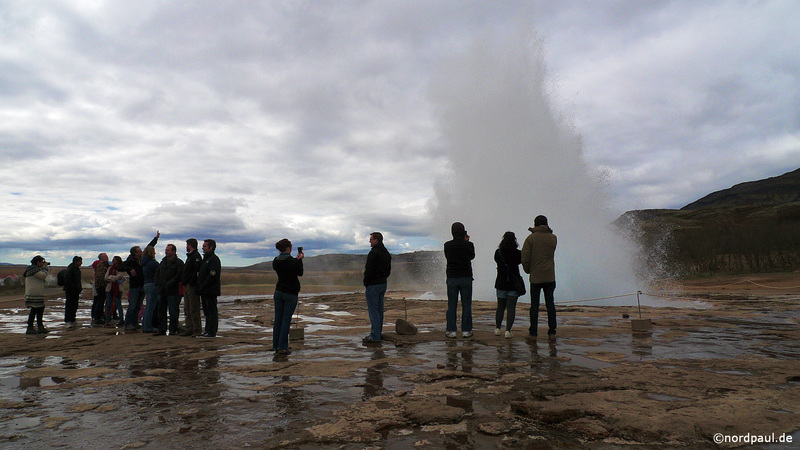 Iceland 2010 was a perfect trip. 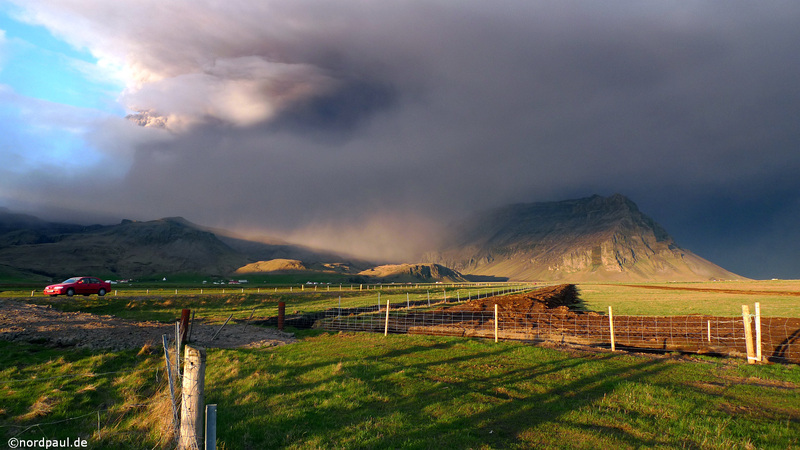 Besides the people, landscapes and natural phenomena, the weather was unique. According to the weather office May 2010 was relatively warm and dry, even June was exceptionally warm and dry. Many new weather records have been set up. 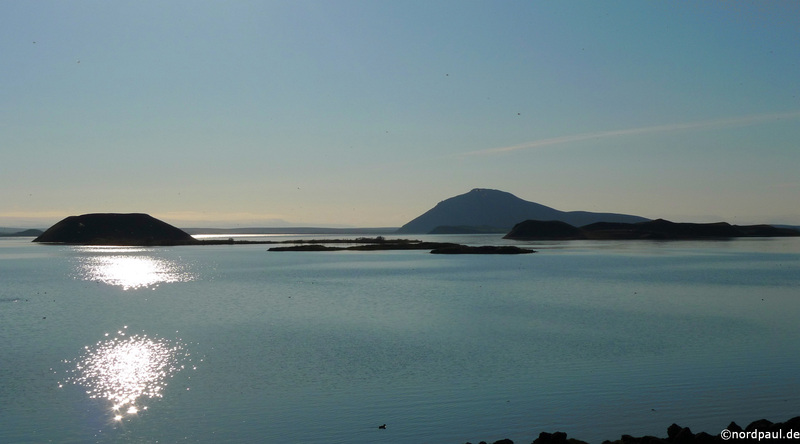 Around the Mývatn was nearly no rainfall in June, instead the number of sunshine hours was as high as never before. Very Lucky!